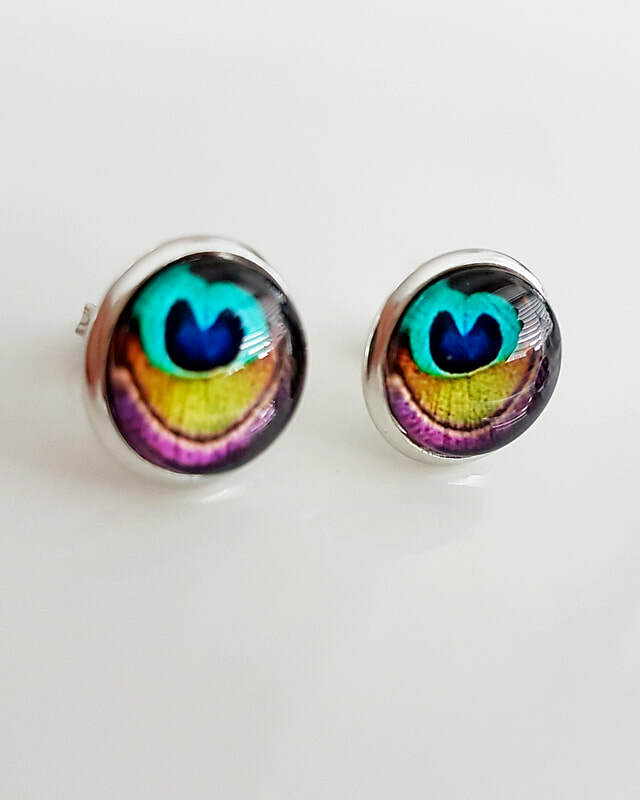 Beautiful images of Peacock feathers with a slight iridescent finish. 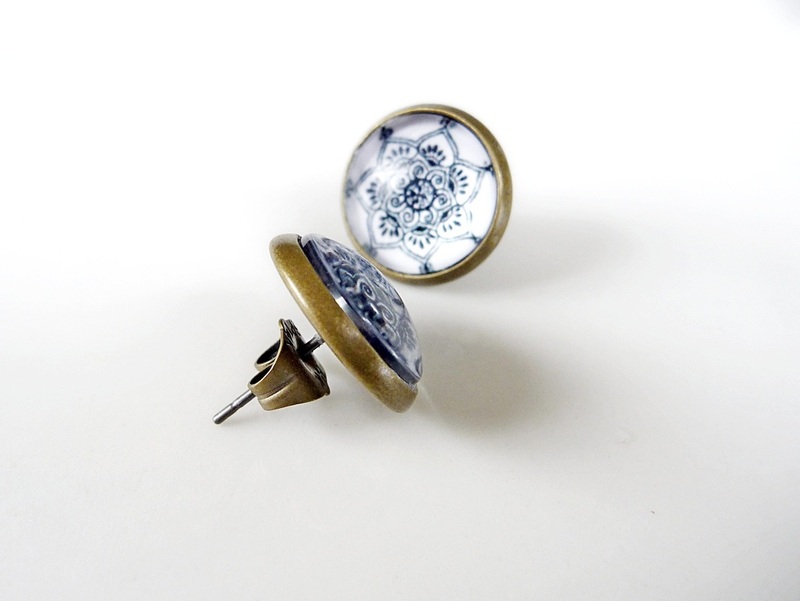 Protected behind clear smooth glass domes and snugly fitted into 14mm silver tone stud settings. 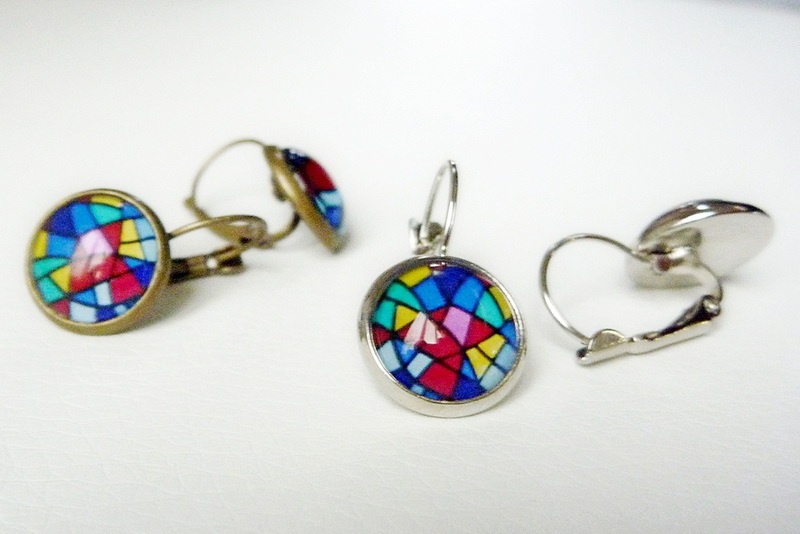 Make your choice of the left or right design at checkout. 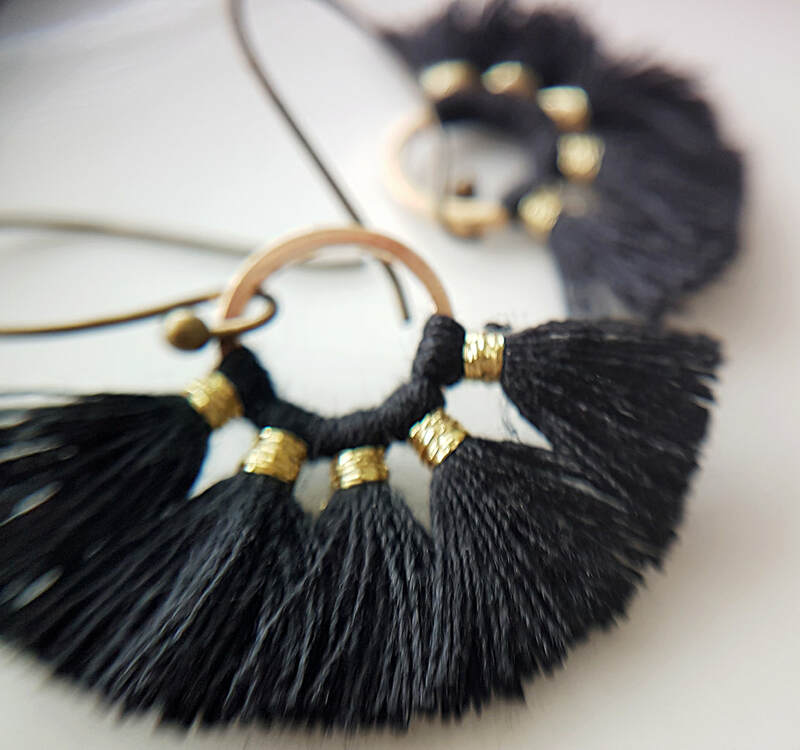 These wee cotton tassel fans, with brass detailing, have a spread of approx 3cm across the top. 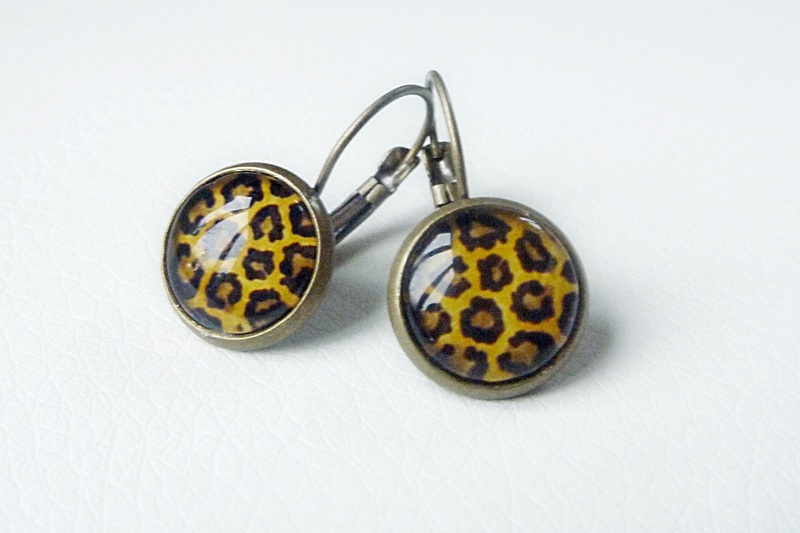 Super cute and fantastic for those that don't like to wear huge earrings. This smaller size is hard to find. 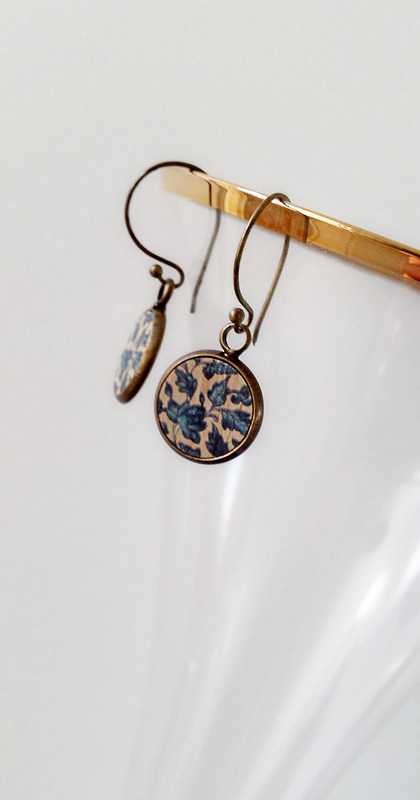 Hung from nice fine antiqued brass ear wires. 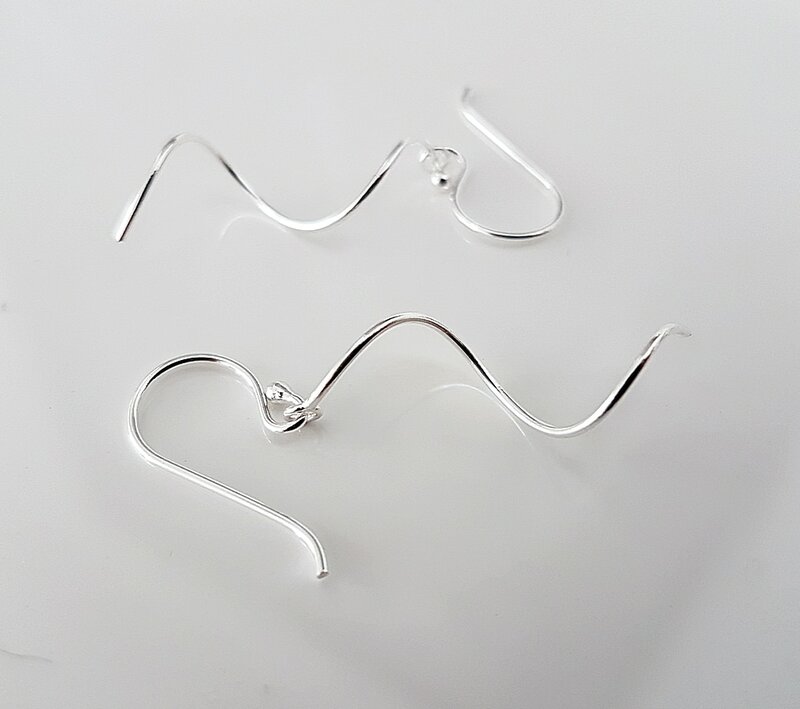 These fine Spirals and ear hooks are both made from Solid Sterling Silver. 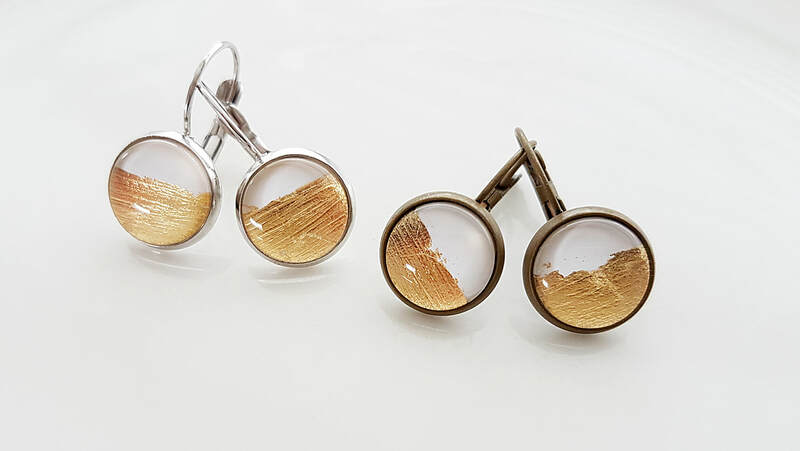 Beautifully smooth and light to wear. The way they swing & catch the light is really lovely. 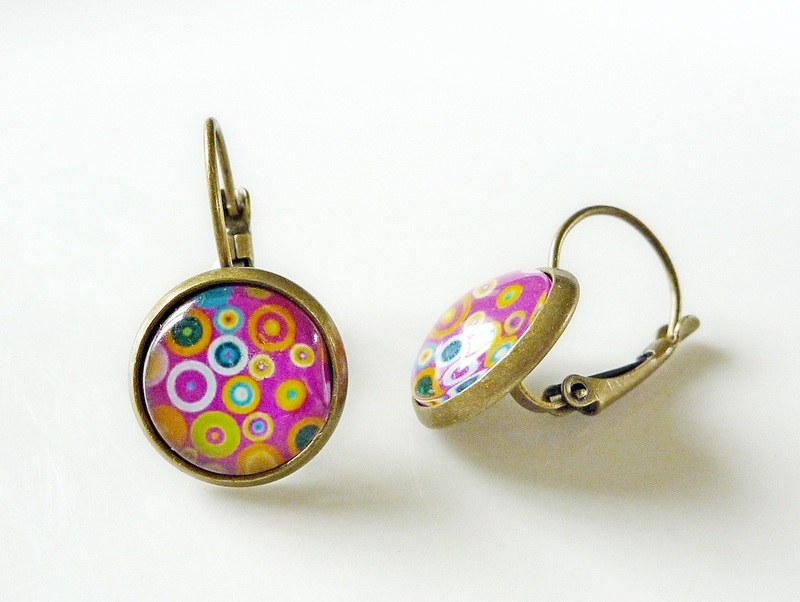 The smooth fish hook wires have a small perfect ball end to keep the spiral dangle on. 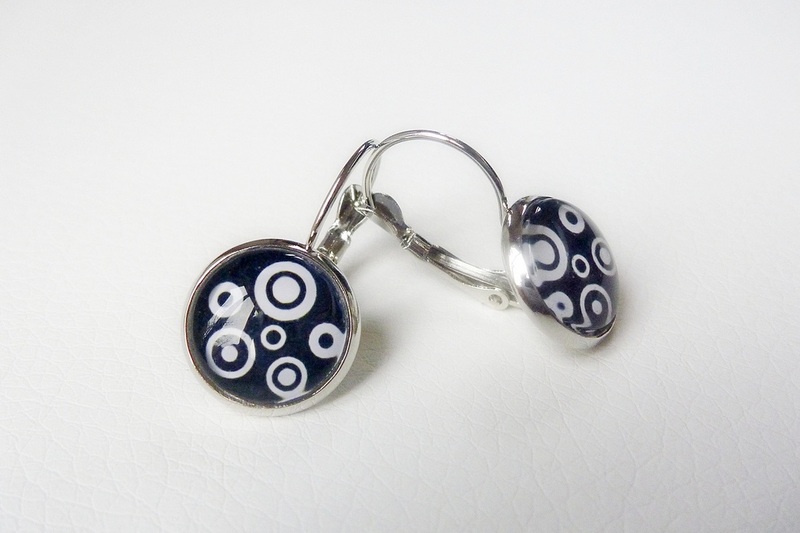 The spiral part is about 2.5cm with a total drop of about 4cm. 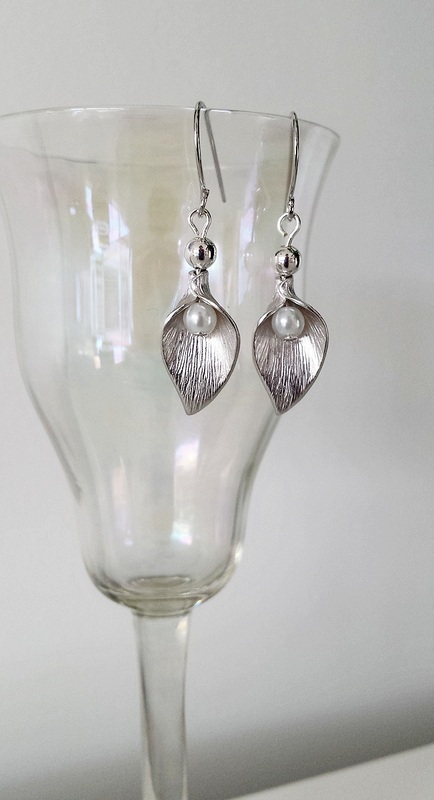 These gorgeous Calla Lily drops are finished in a lovely textured matte silver. 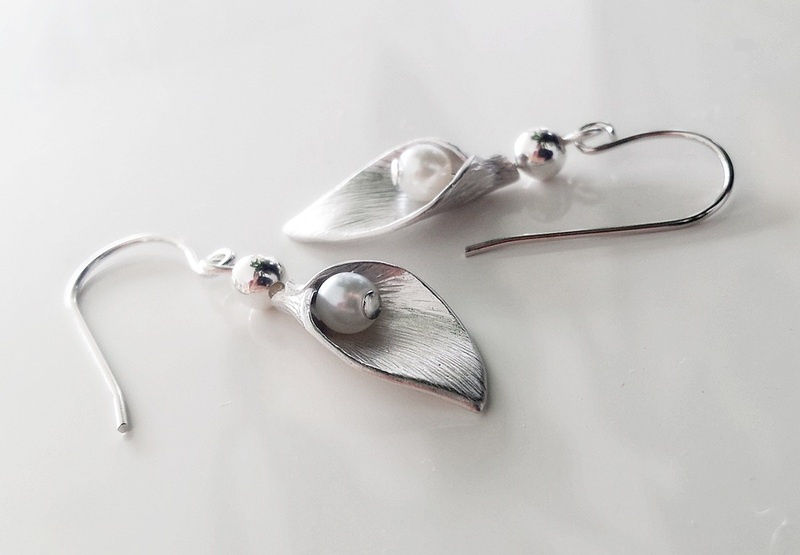 I have strung them along with a glass pearl from polished Rhodium finished ear wires. The total drop is approx 4cm. 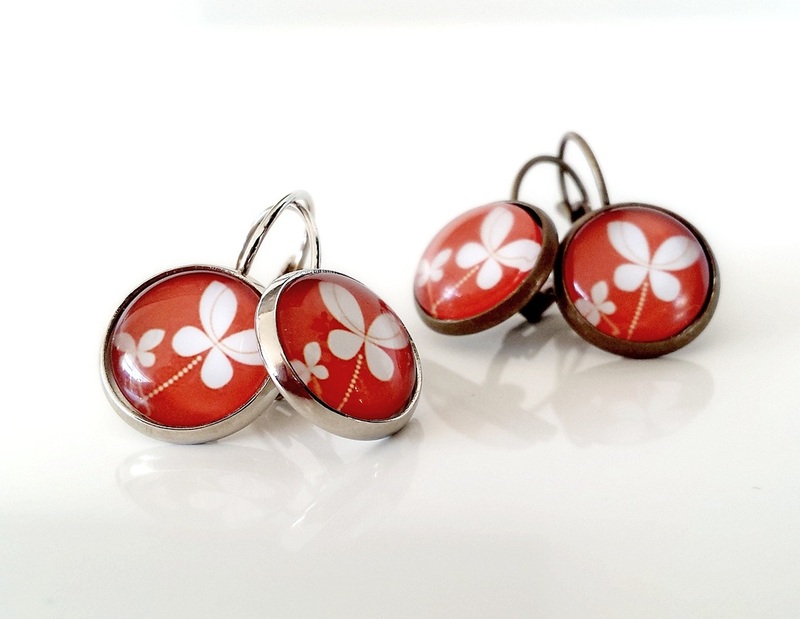 Lovely quality and light to wear. 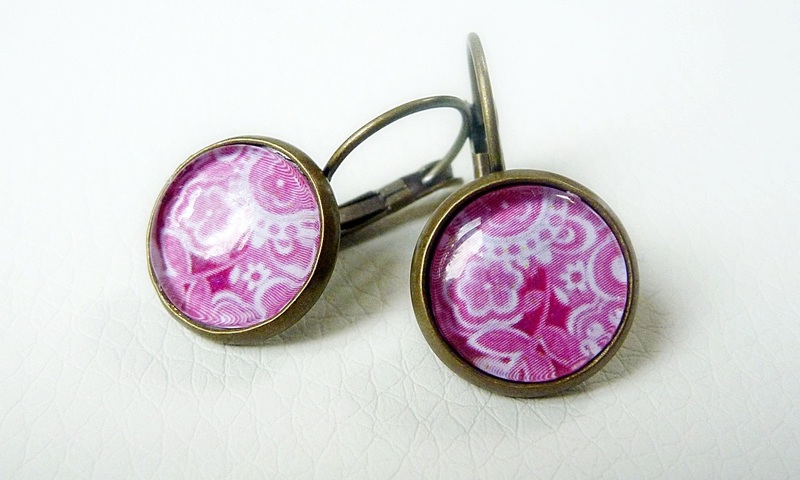 Classical and feminine. 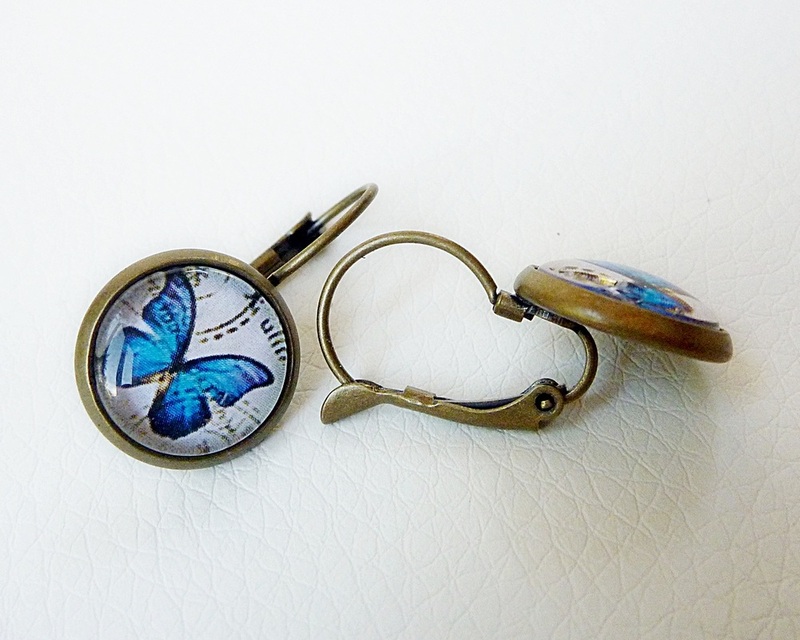 The matching pendant is available from the charms and pendants section. 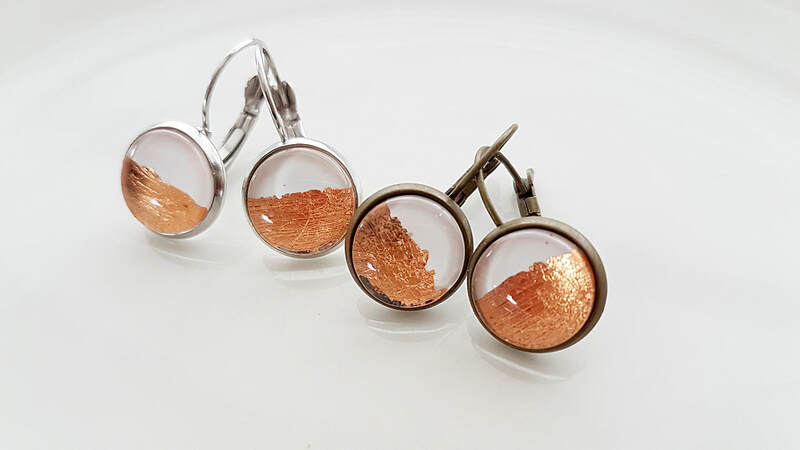 14mm wide earrings with white and metallic foil set behind a clear resin dome. 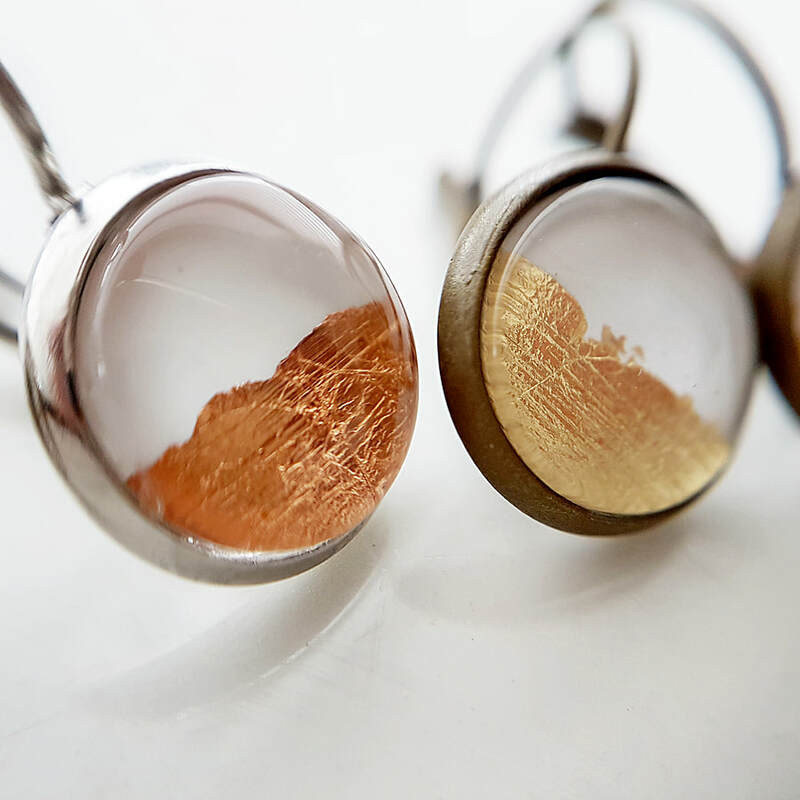 The metallic colour is available in Yellow Gold, Rose Gold or (Silver temp sold out). 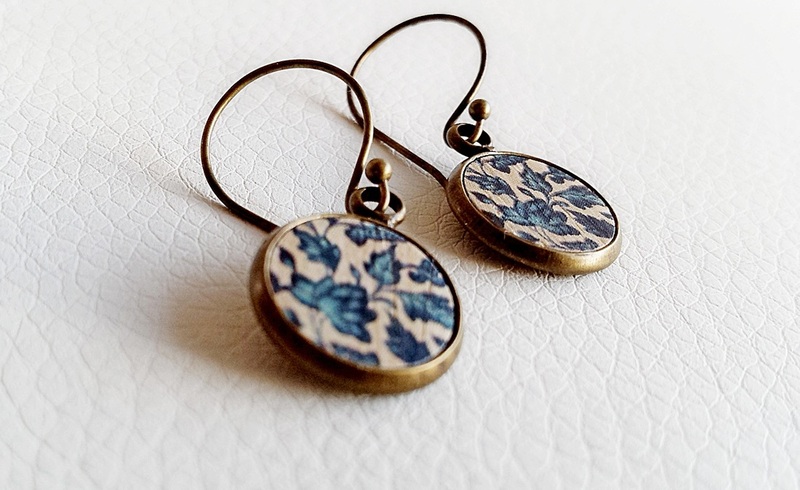 Settings available in 14mm Antiqued Brass or Silver, You tick your colour & setting choice as you add them to your cart. 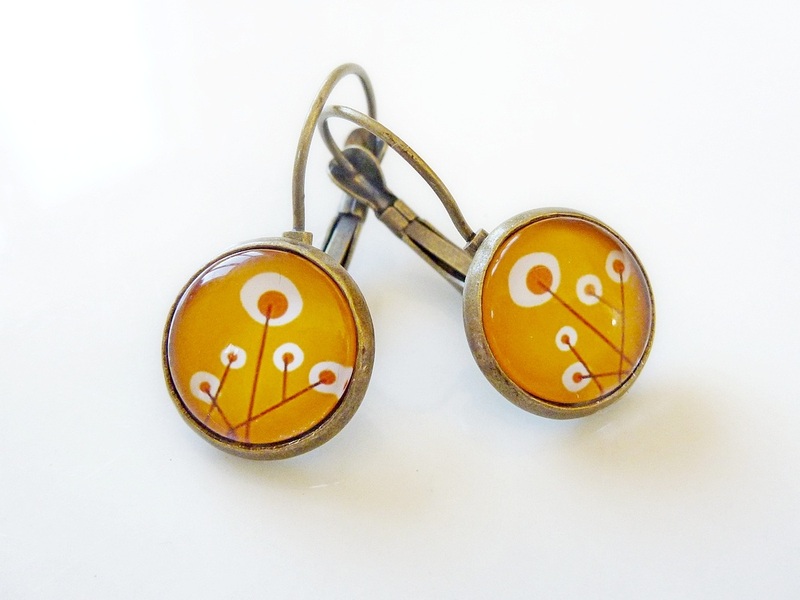 The hinged back on the French wires make them nice and secure worn in pierced ears. 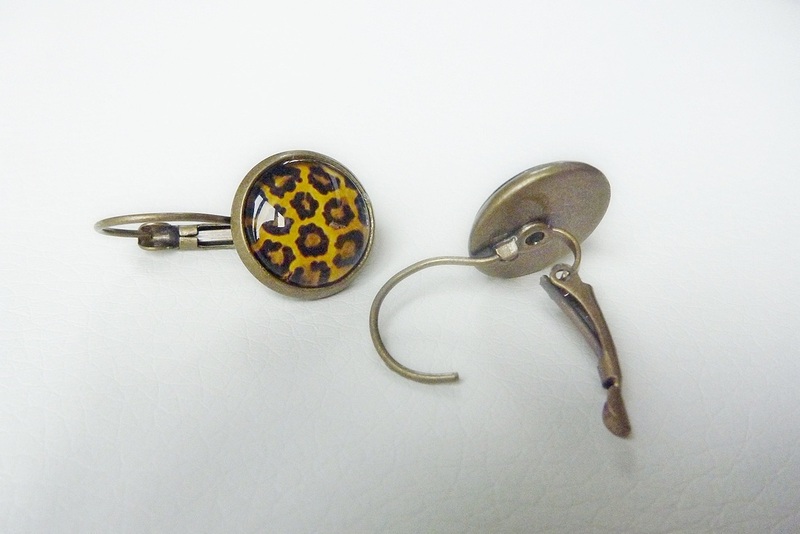 The total drop from the top of the ear wire is about 2.5cm. Lead & Nickel free. 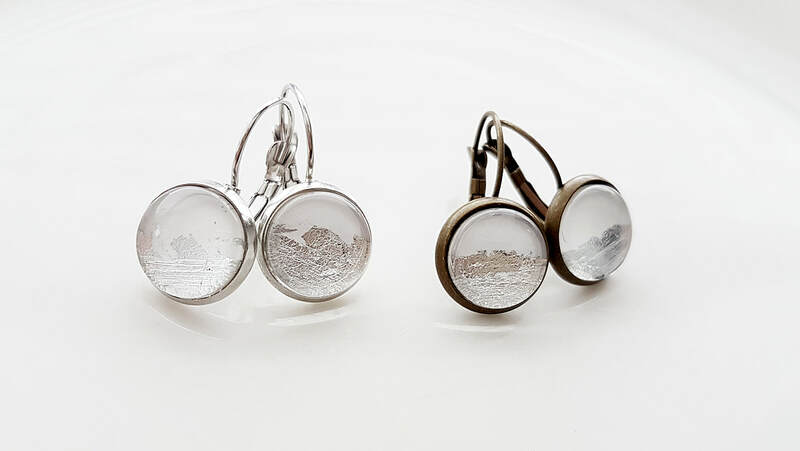 These earrings are stunning in classic antiqued silver or antiqued brass. 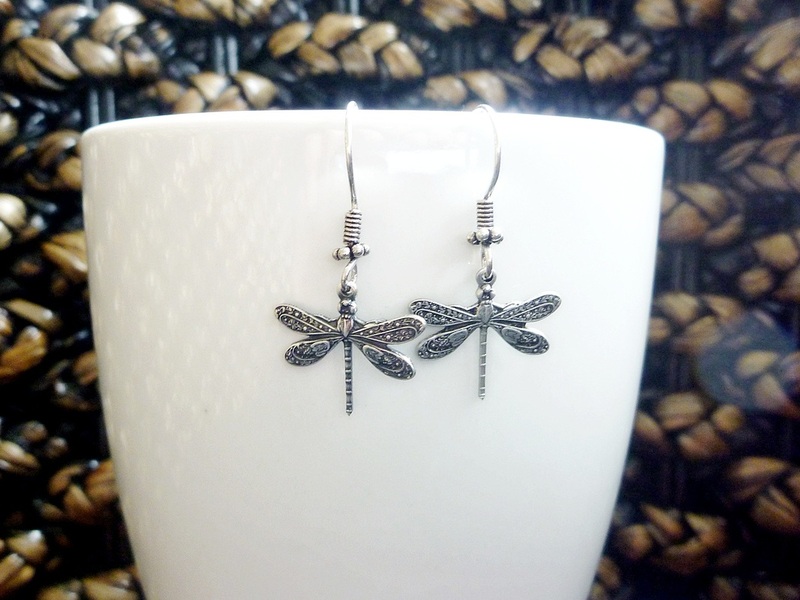 Each dragonfly is meticulous in its detail. 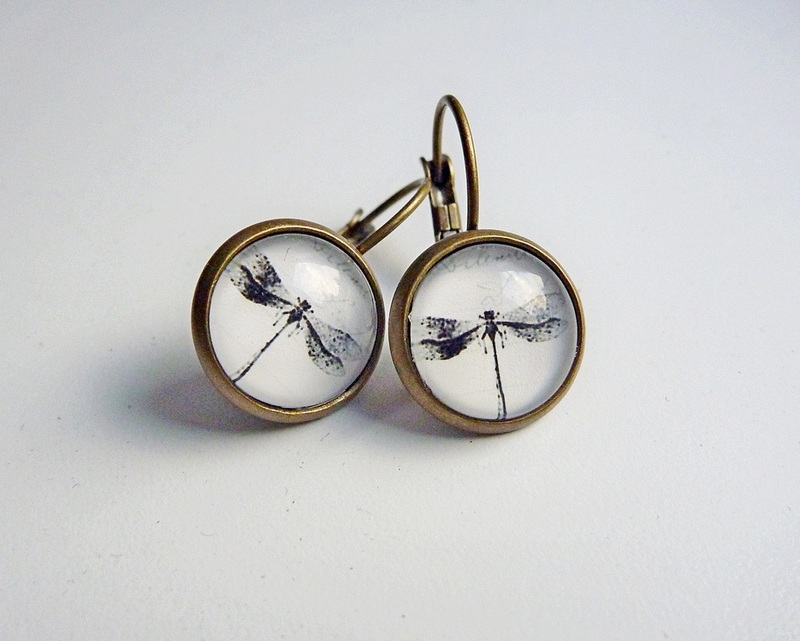 They have a wing span of about 17mm. Hung from hand twisted earwires. Choose your colour option. 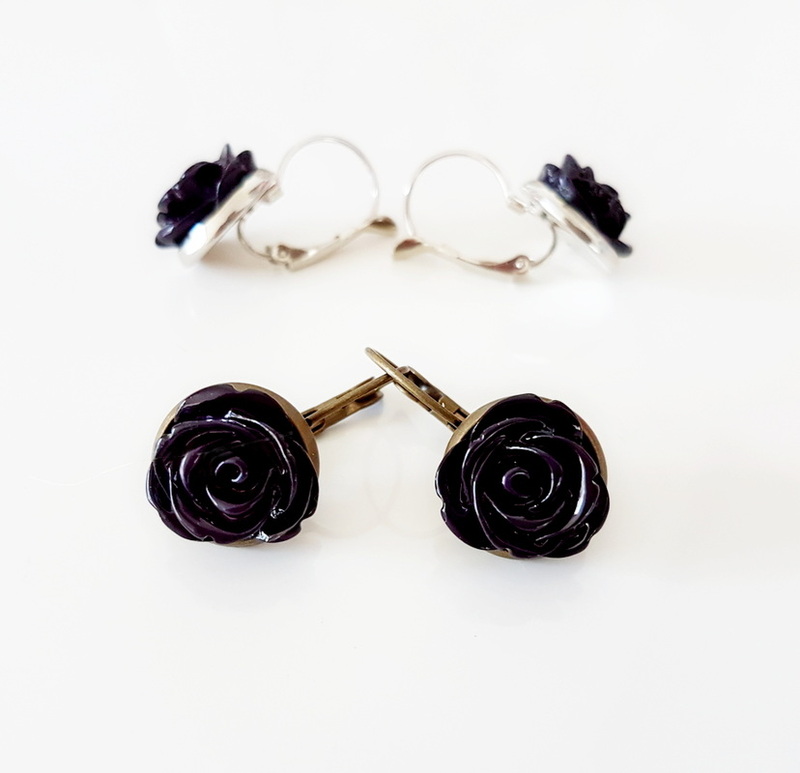 14mm wide earrings with a beautiful black resin rose recessed into the lead & nickel free settings. 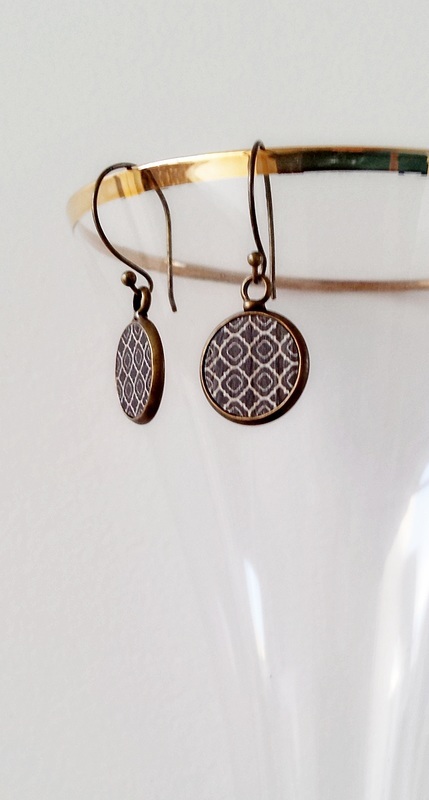 Available in Antiqued Brass or Silver, Make your choice at checkout. 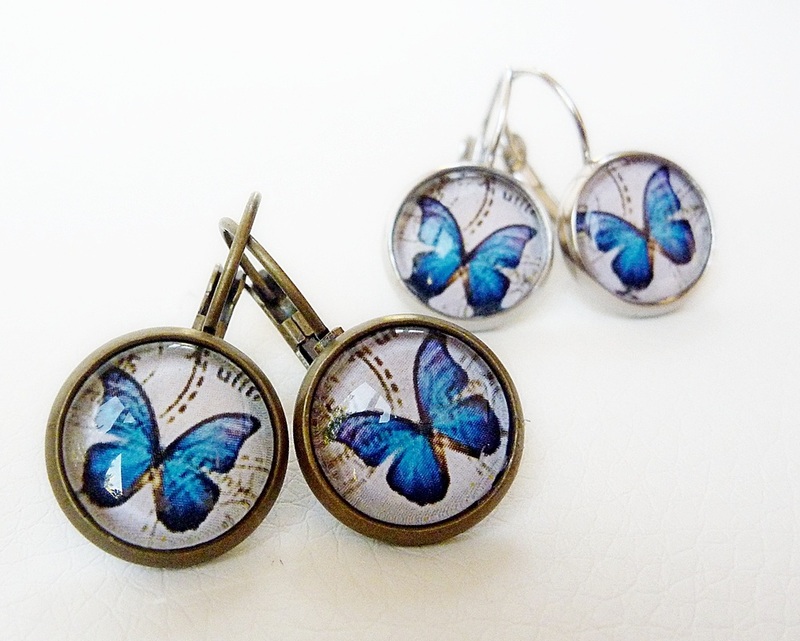 The hinged back on the French wires make them nice and secure worn in pierced ears. 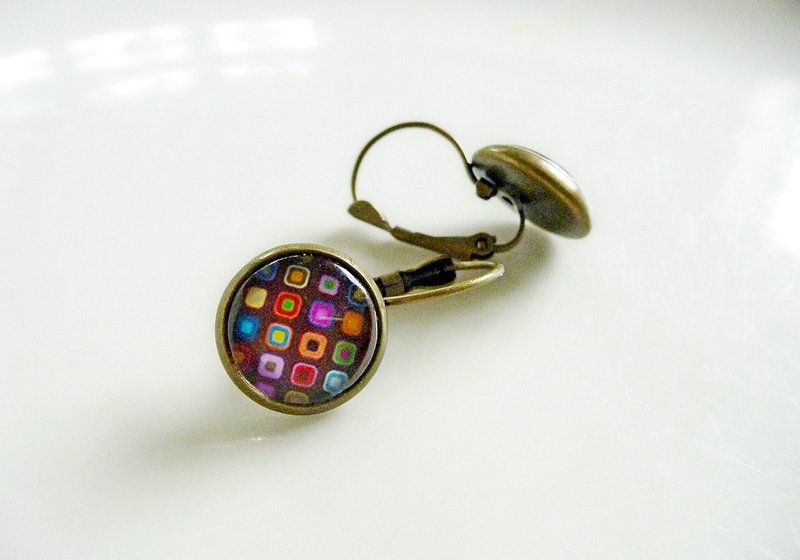 The total drop from the top of the ear wire is about 2.5cm. 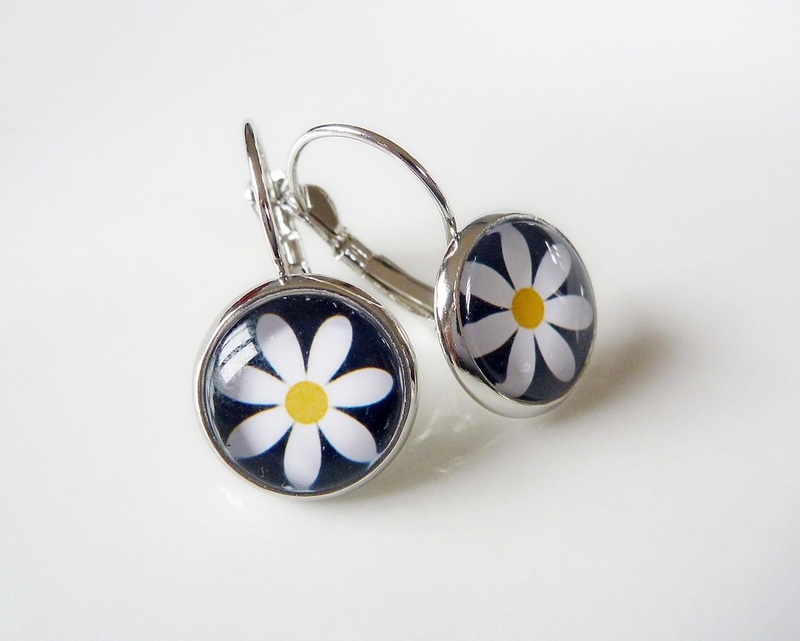 These simple but cute wee earrings are made from Lead & Nickle free Stainless Steel. 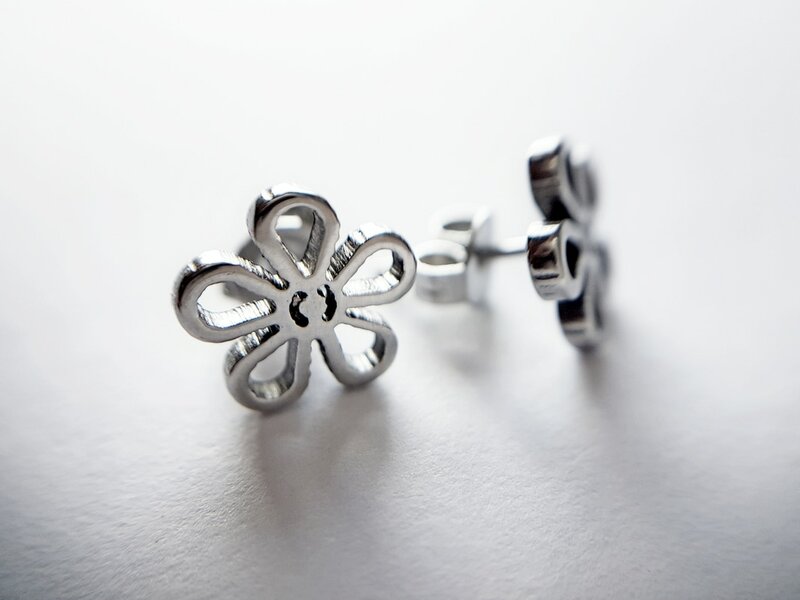 A good option for those with metal allergies. 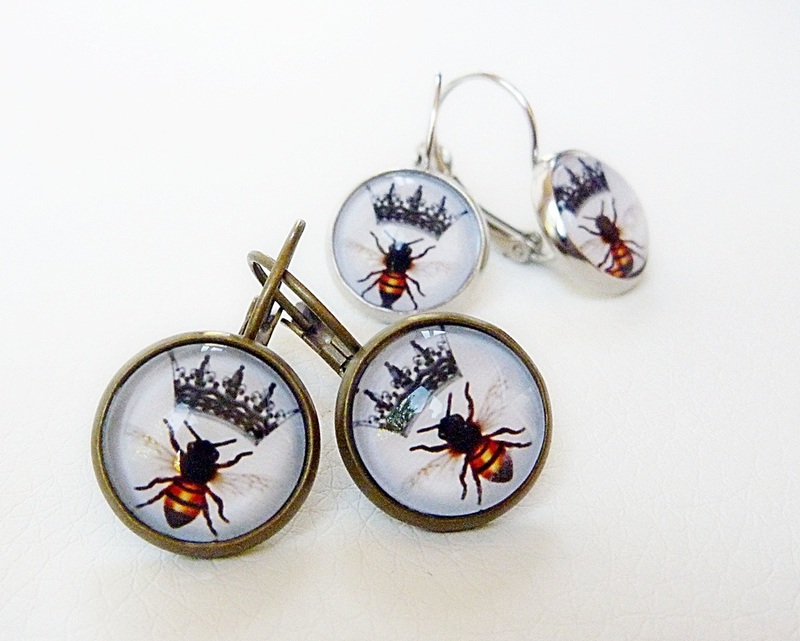 They are about 10mm across in size. 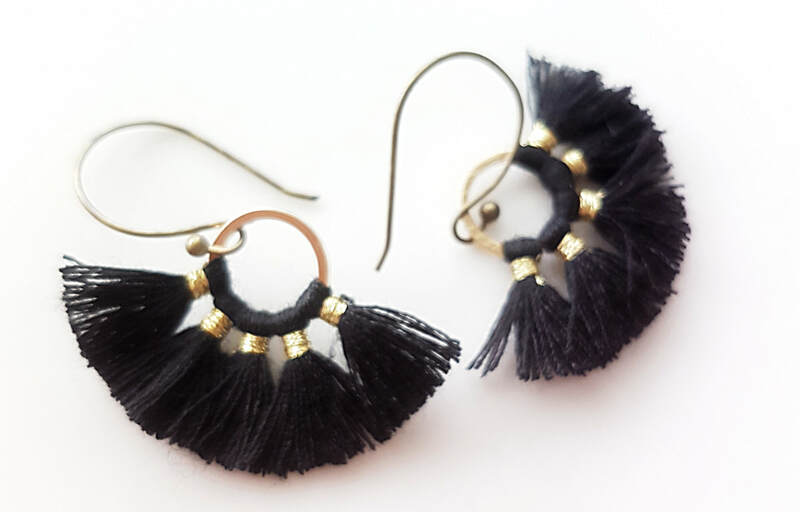 These mini tassels are made from lovely soft Nubuck suede in black. Strung on ball & coil stainless steel ear-wires. 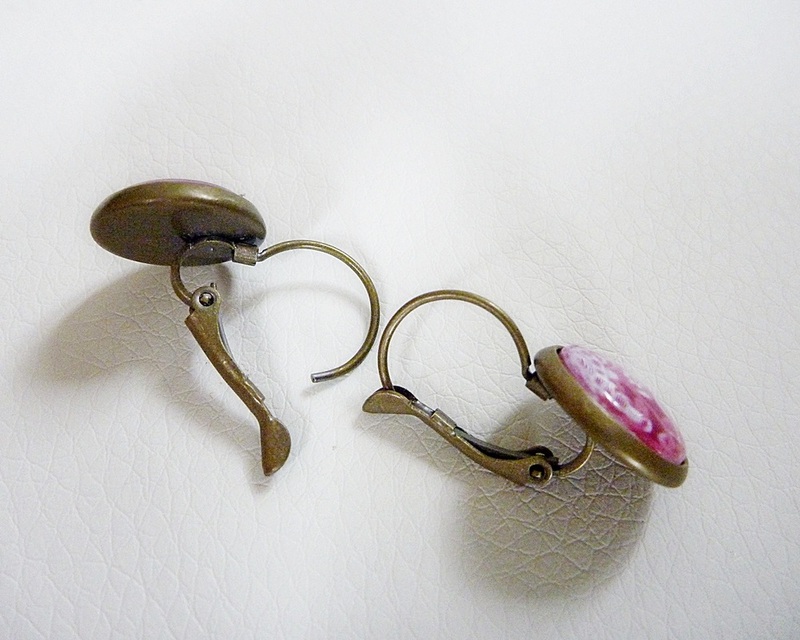 The total drop from the top of the ear-wire is about 5cm. Any questions contact me. 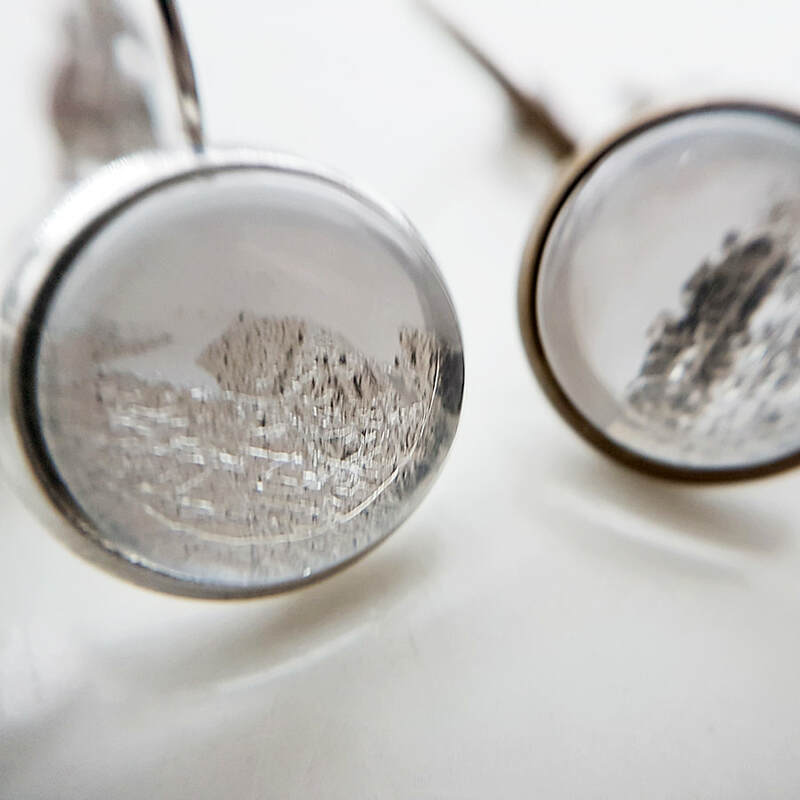 Cute 14mm wide earrings with a classic Black and White image protected behind lovely clear glass domes and recessed into antiqued brass settings. 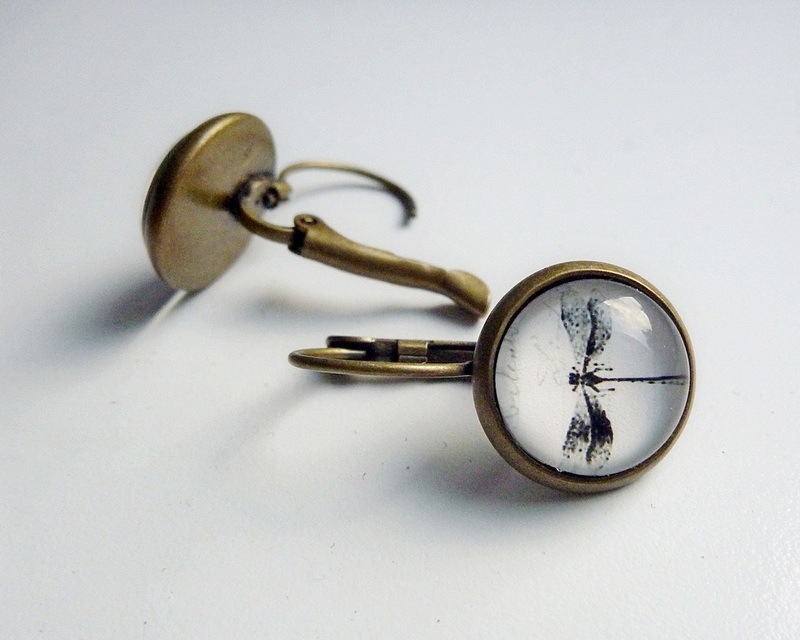 These funky earrings incorporate empty Winchester Bullet casings. I have removed the centre detonator and replaced it with a gorgeous faceted foil backed clear crystal and darkened the wording. The sparkle against the brass is gorgeous. 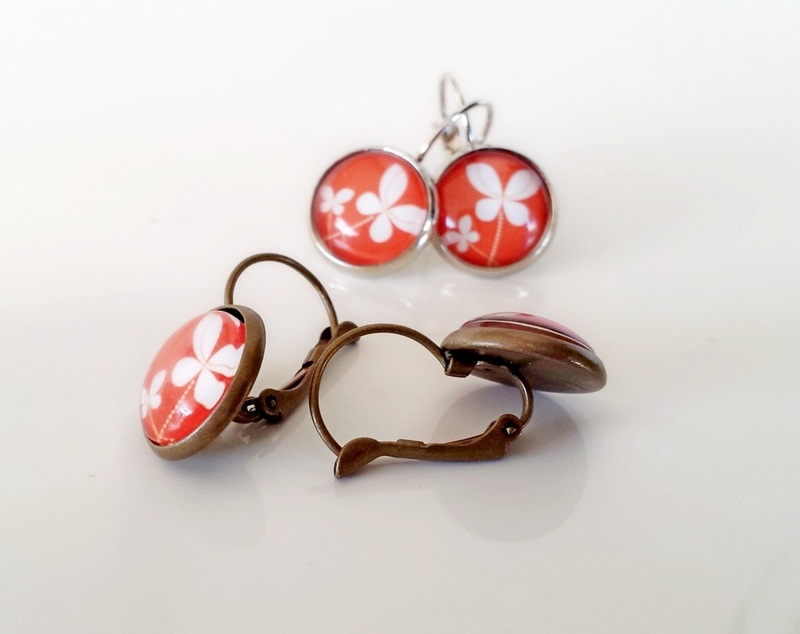 The settings come complete with the matching ear stopper at the back for secure wearing. 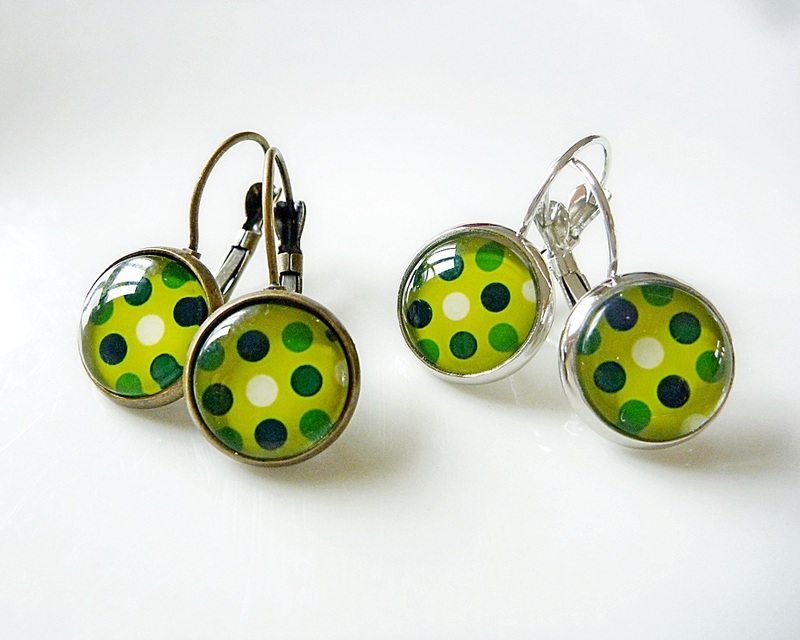 Contact me if you want the emerald version, another colour? or you don't want the words darkened. Otherwise they will be as per the larger photo. Be Funky, Go Ballistic. 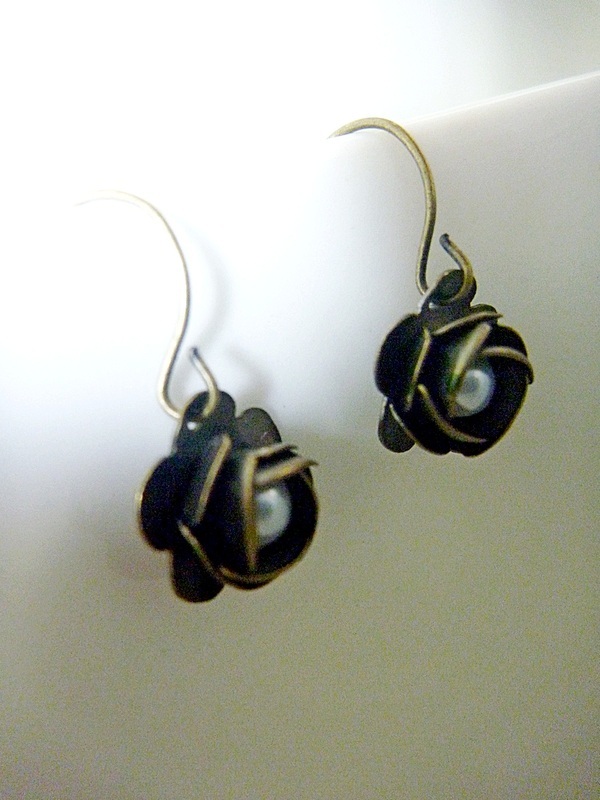 I have created these stunners with black sculpturing clay that hardens to a lovely semi-gloss finish. 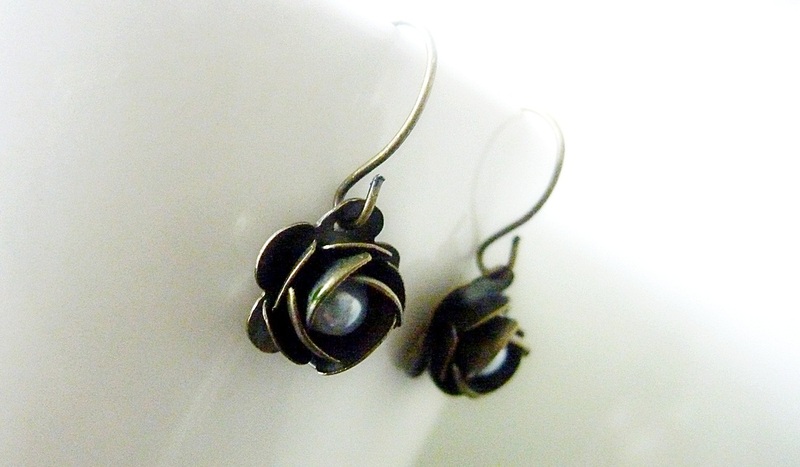 The rose & ear wires are all in Antiqued Brass. 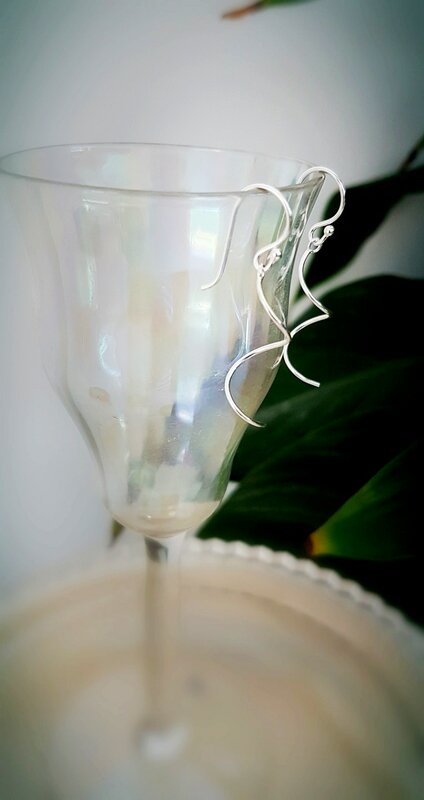 The rose holds a small glass pearl bead. 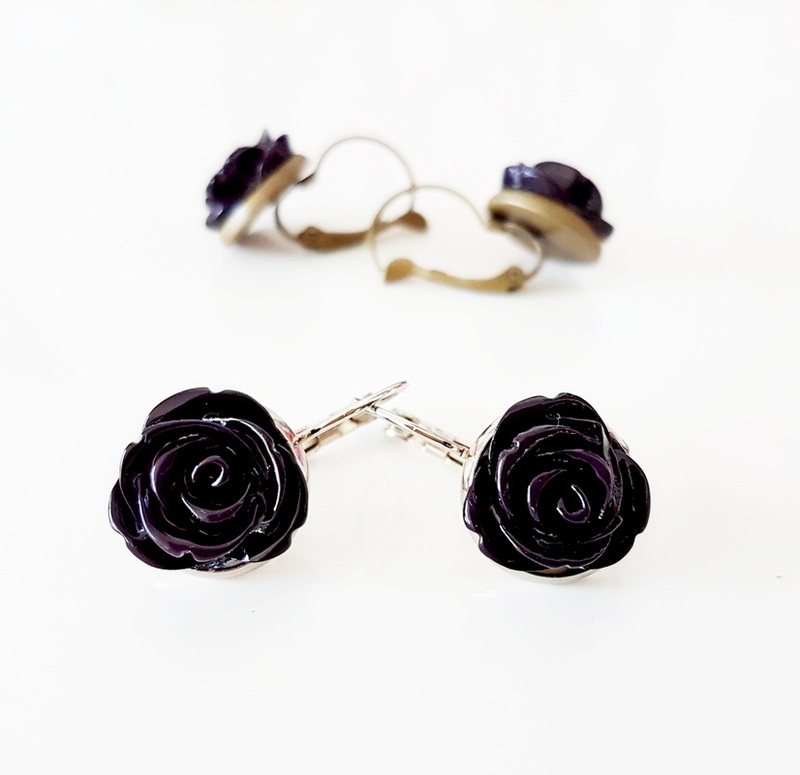 Total length from the top of the ear-wire to the bottom of the rose is about 2cm. 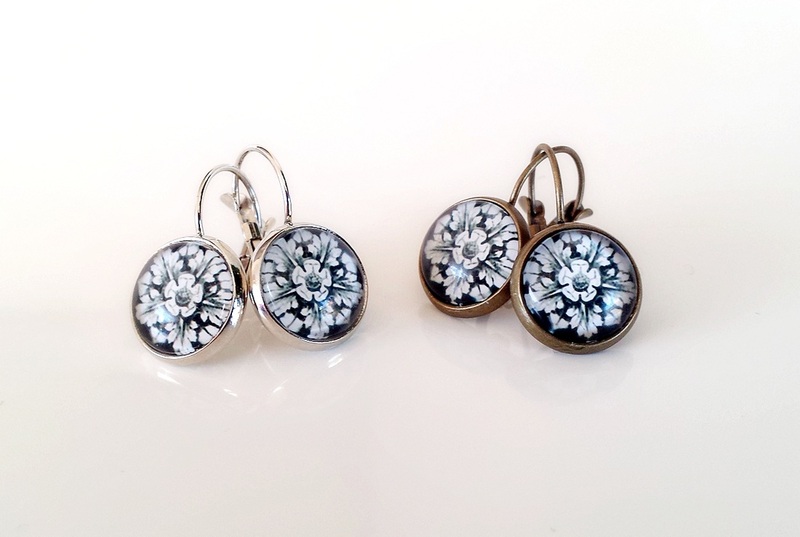 14mm wide earrings with gorgeous tiny dried flowers set in a clear resin dome. 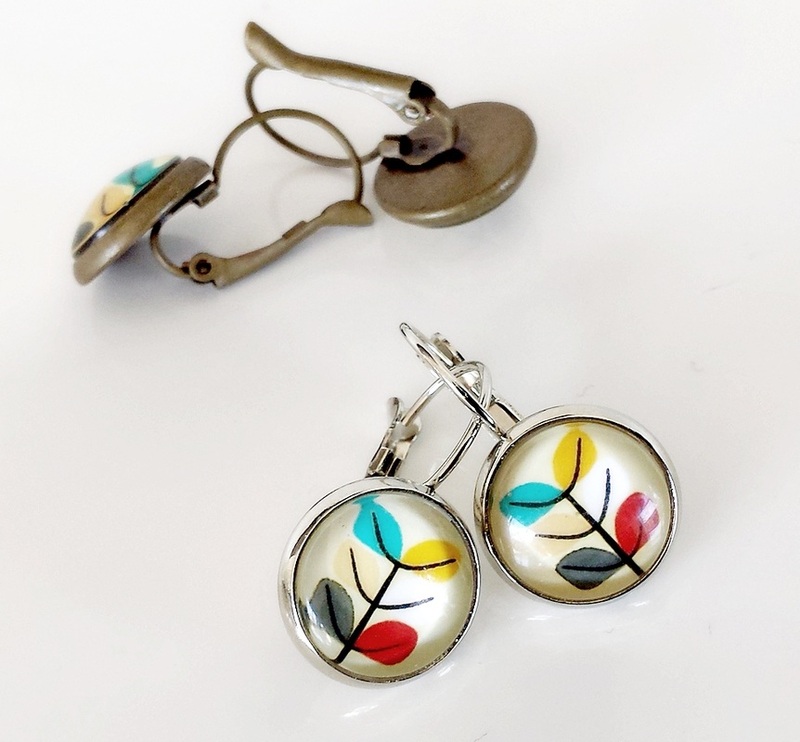 Available in Antiqued Brass or Silver, You tick your colour & setting choice as you add them to your cart. 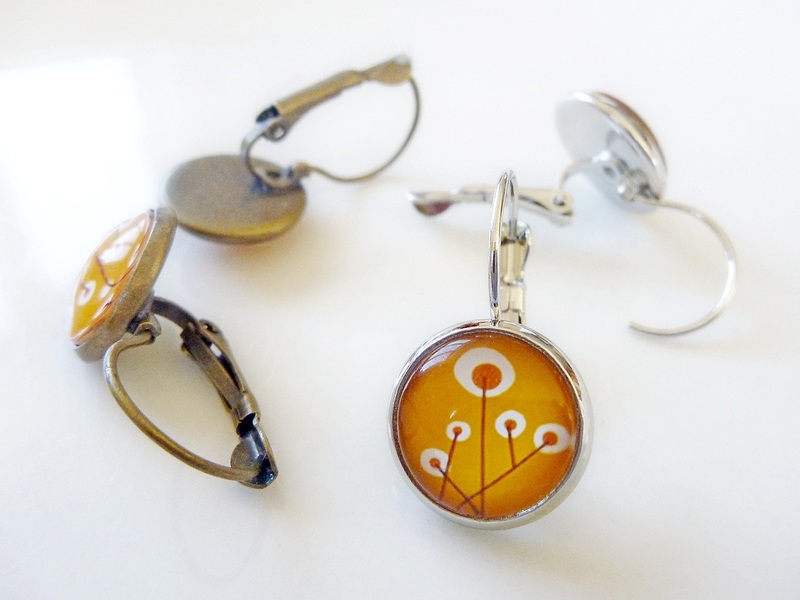 Tiny dandelion seeds have been cast into a clear resin 15mm diameter globe. 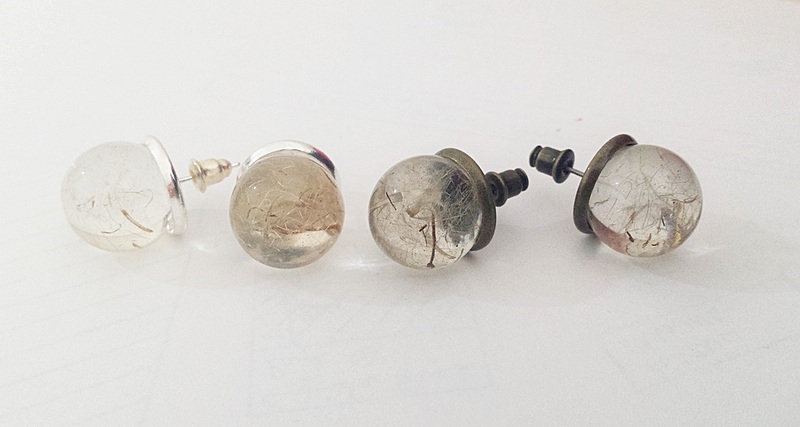 Then I have recessed them into stud earring blanks. 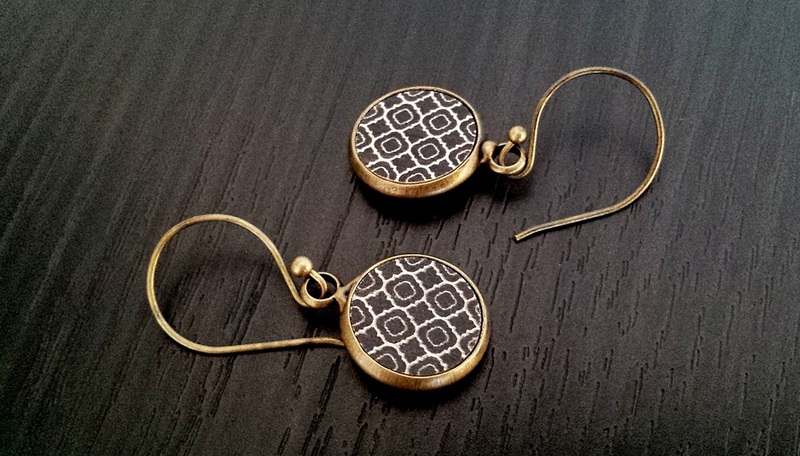 Choose Silver or Antiqued Brass Settings before you add a pair to your cart. Any questions?, contact me. 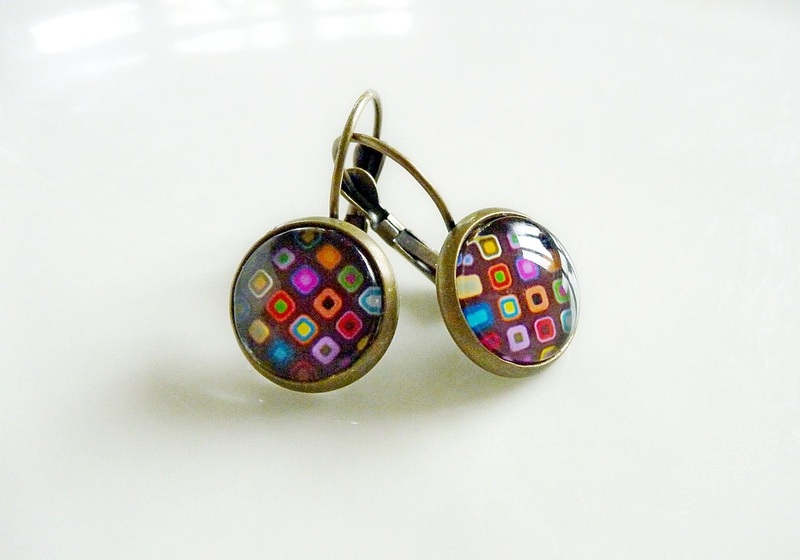 These Egyptian glass rhinestones have stunning sparkle and are applied by hand over a light weight resin core. 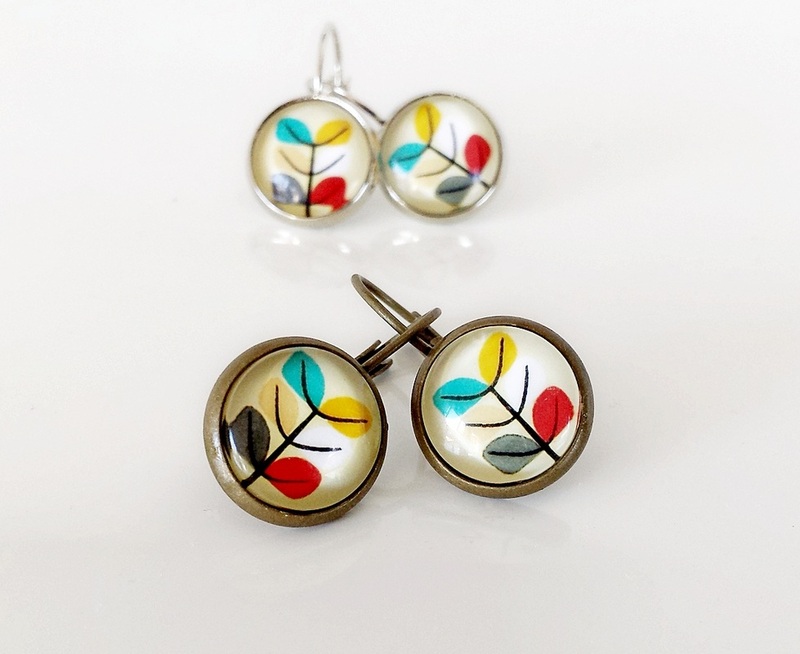 These catch the light as they move beautifully. 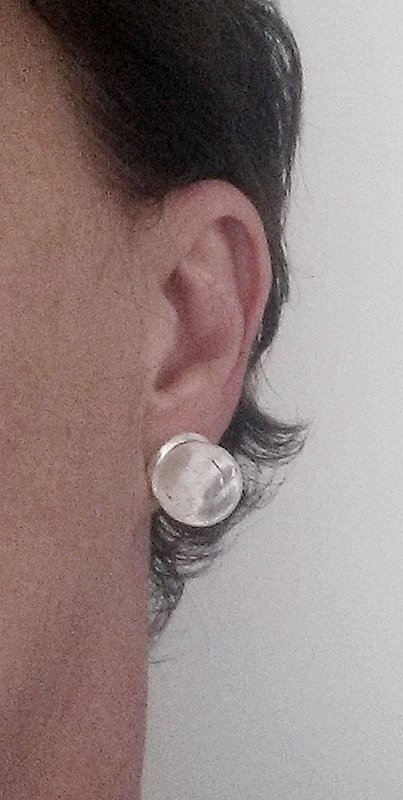 They measure about 8mm and I have strung them with a small clear crystal from hand twisted silver tone ear-wires. 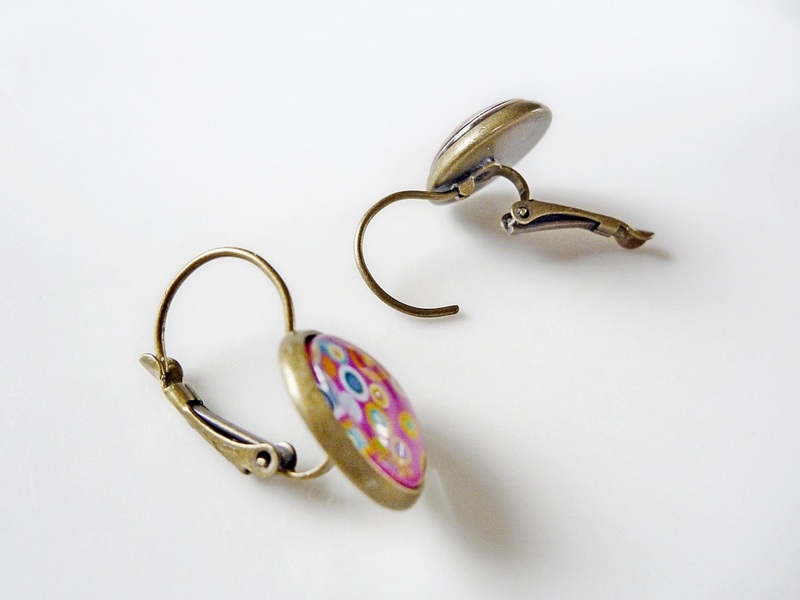 The total drop from the top of the ear-wire is approx 3.3cm. 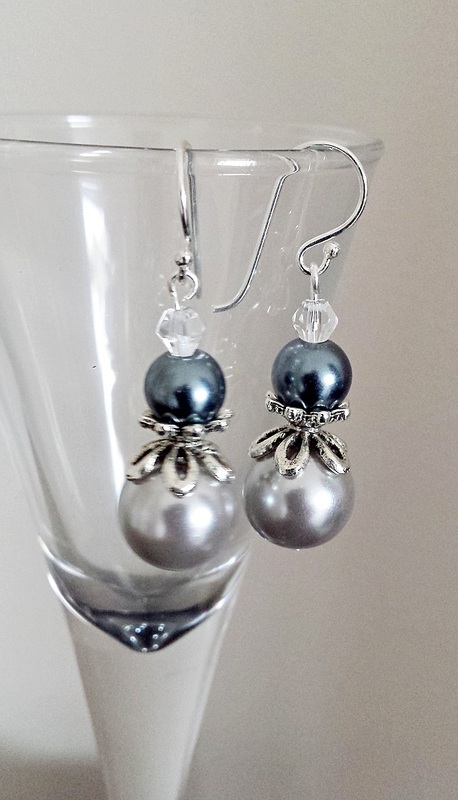 This is a gorgeous combination of Glossy Pearl beads, filigree caps and a small clear crystal hung from gorgeous solid sterling silver ear wires. 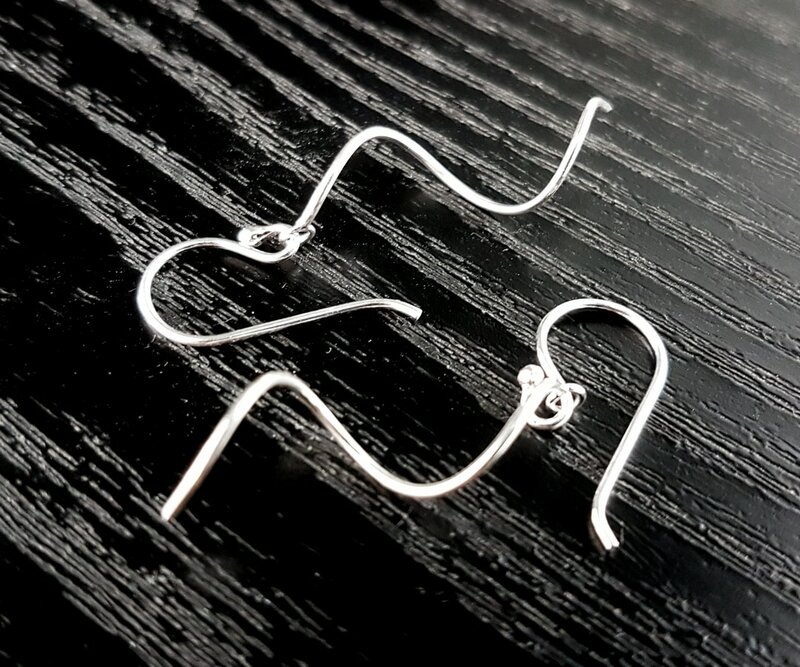 The total drop from the top curve in the ear wire is approx 4cm. 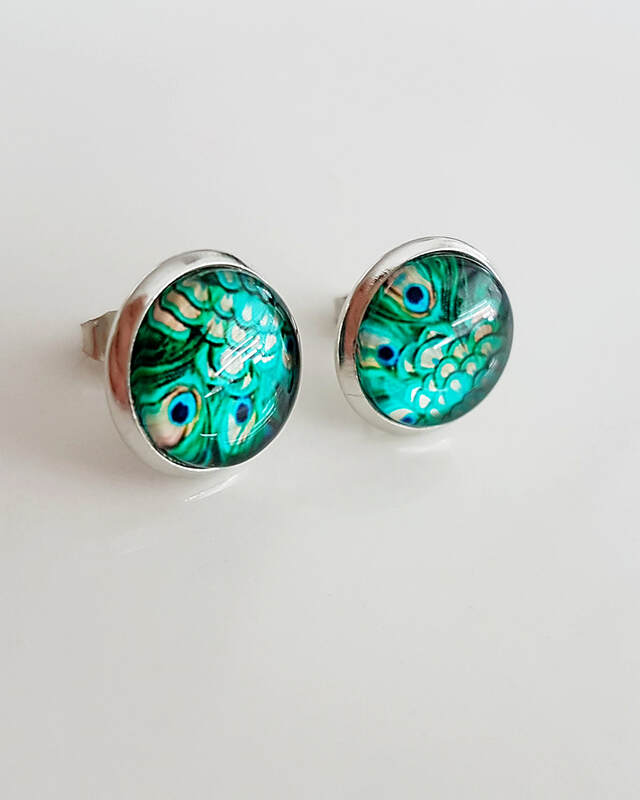 I am happy to custom make using other beads, crystal and colours, feel free to contact me. 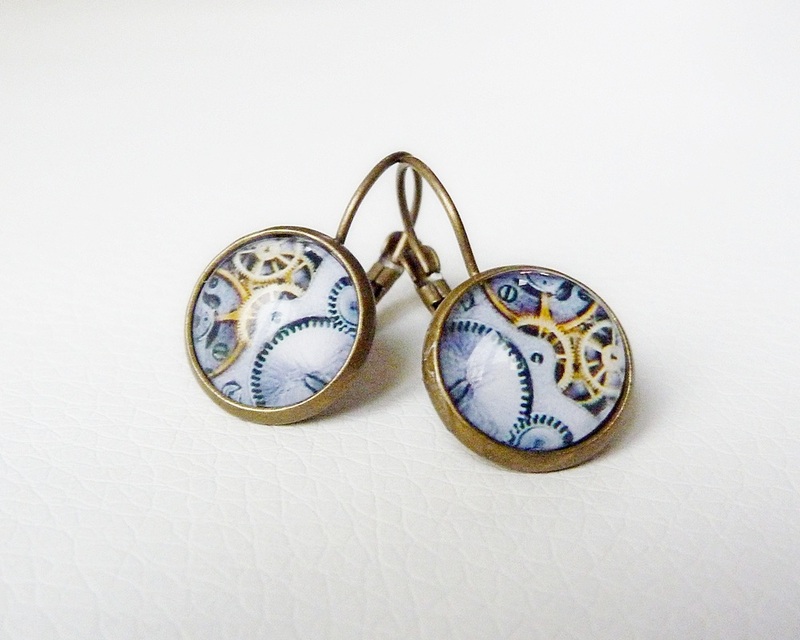 Cute 14mm wide earrings with a gorgeous Retro stem pattern behind a clear glass dome. Lead & Nickel free. 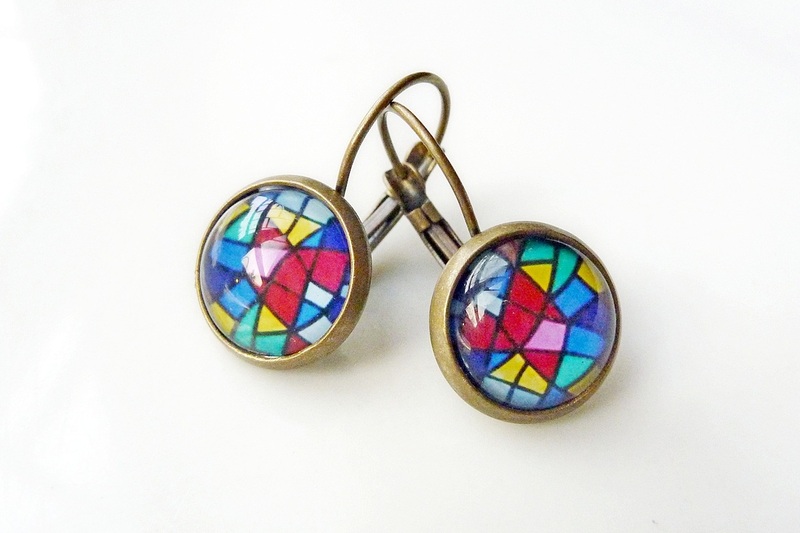 Cute 14mm wide earrings with a gorgeous "church window" image behind a clear glass dome. Lead & Nickel free. 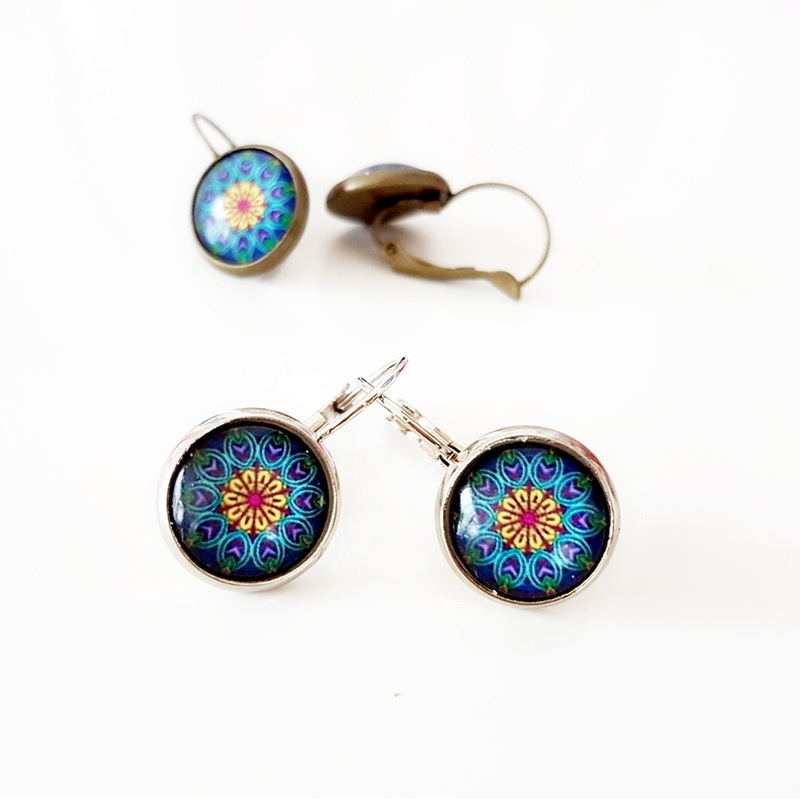 Cute 14mm wide earrings with a gorgeous colourful image behind a clear glass dome. Lead & Nickel free. 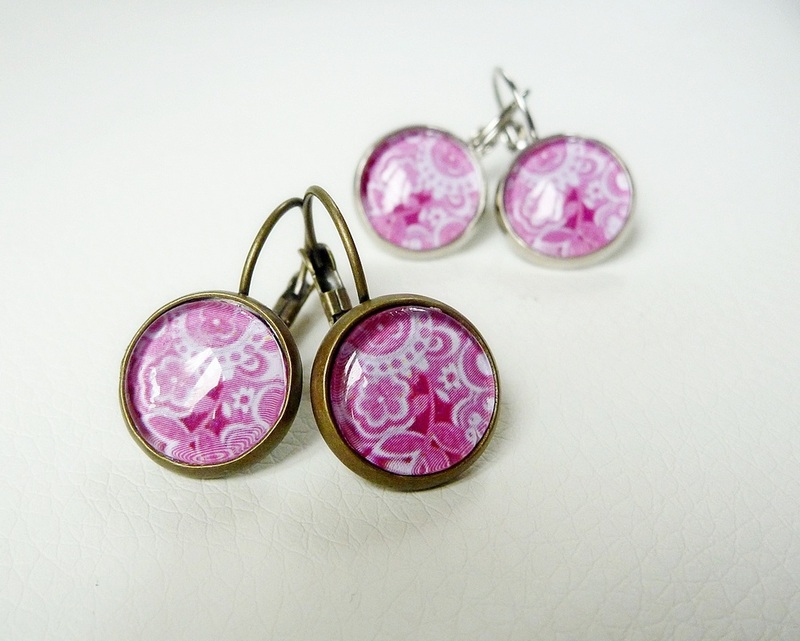 Cute 14mm wide earrings with a gorgeous Raspberry Pink image behind a clear glass dome. Lead & Nickel free. 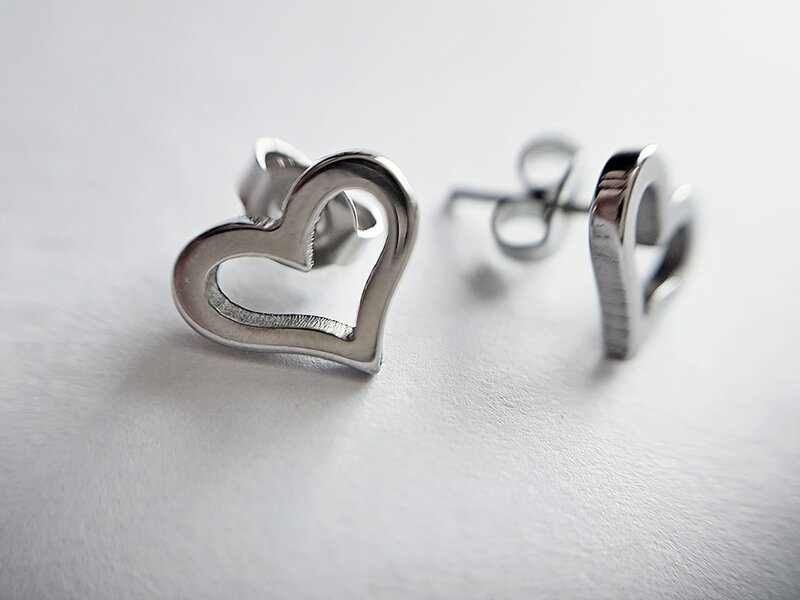 Very versatile ear-rings to add to your gorgeous collection of favourites. 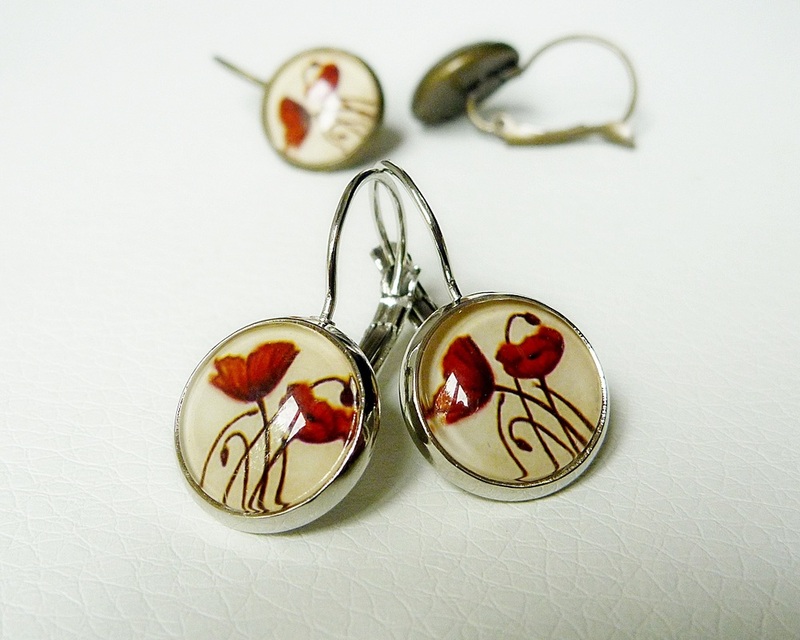 Cute 14mm wide earrings with a gorgeous Red Poppies image behind a clear glass dome. Lead & Nickel free. 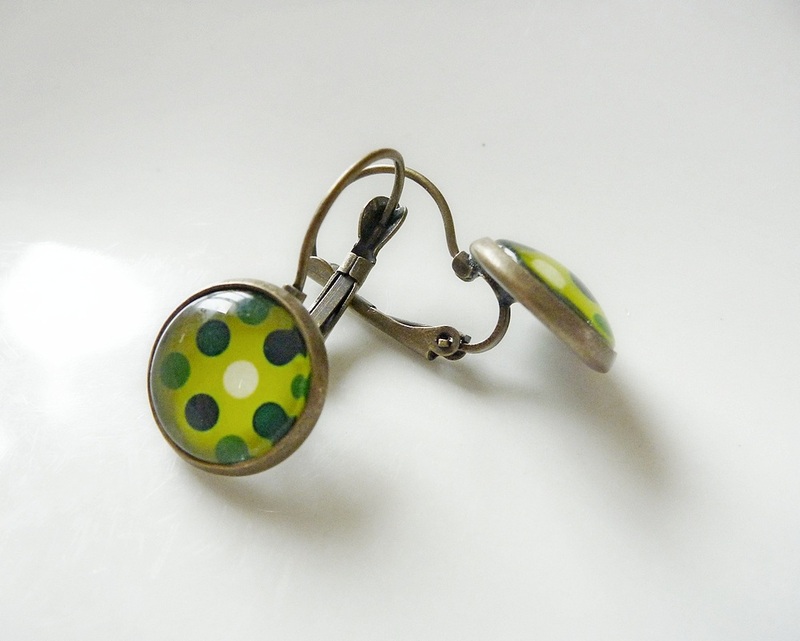 The hinged back on the French wires make them nice and secure worn in pierced ears. 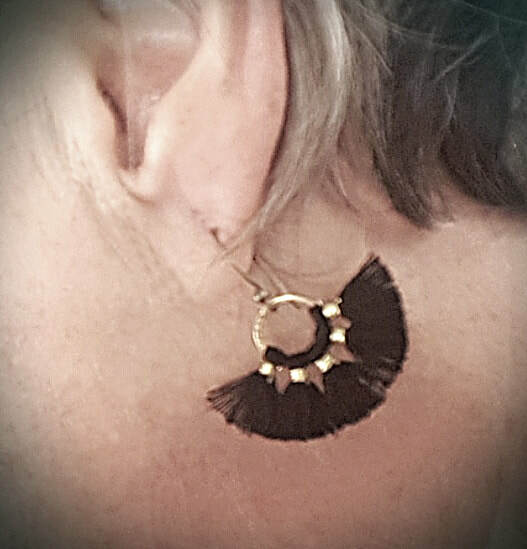 The total drop from the top of the ear wire is about 2.5cm. 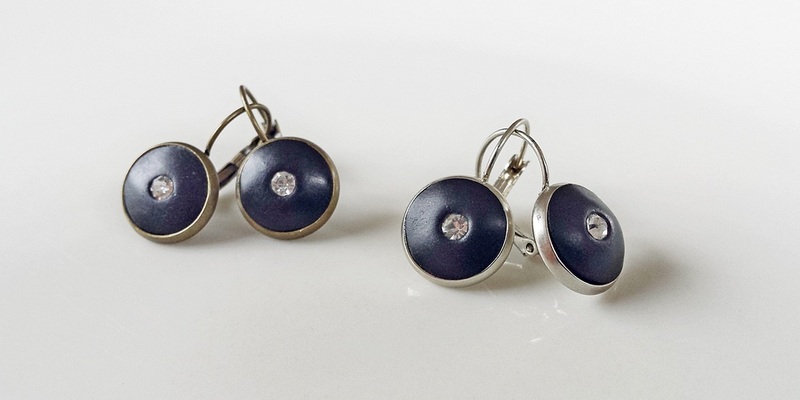 Very versatile ear-rings to add to your gorgeous collection of favourites. 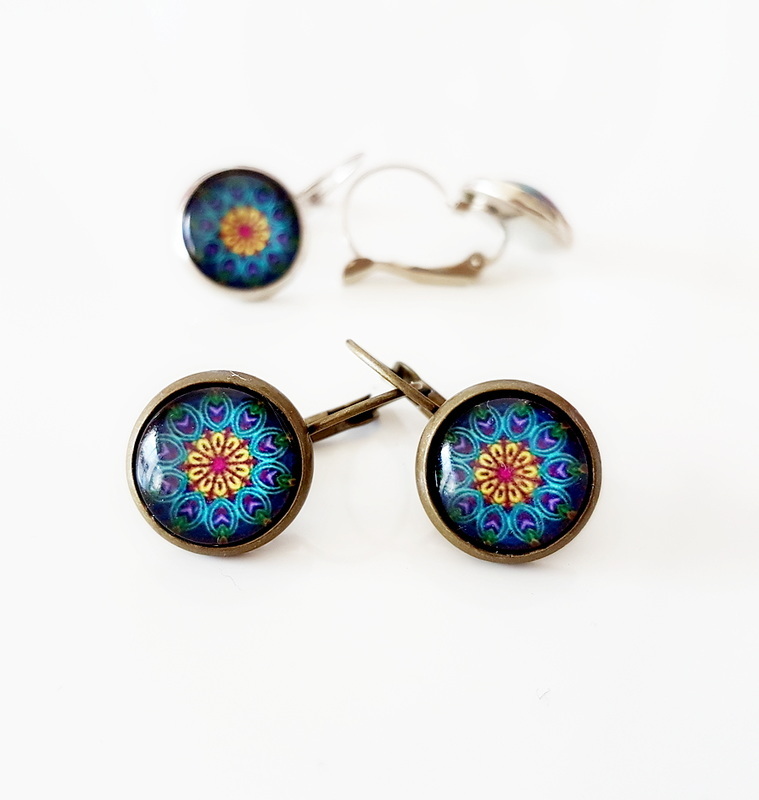 Cute 14mm wide earrings with a gorgeous Tapestry look image behind a clear glass dome. Lead & Nickel free. 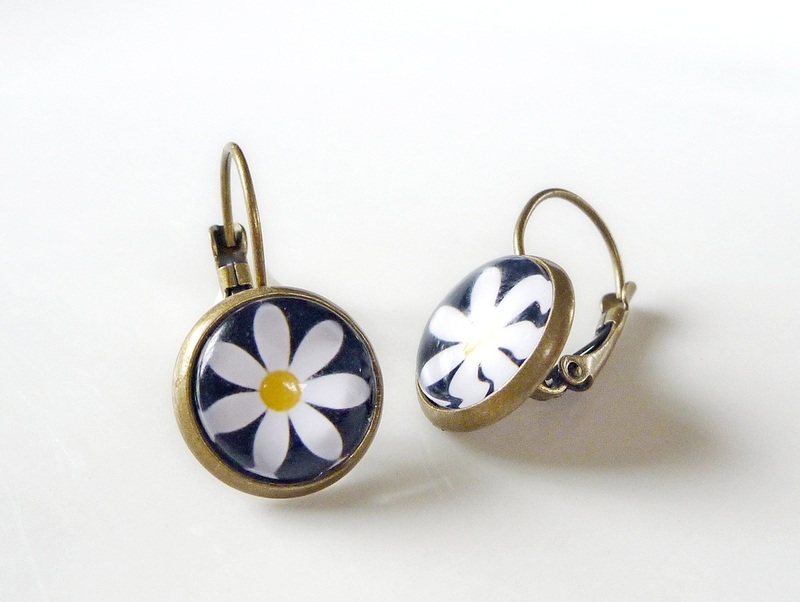 Several items can be sent together at no extra cost. 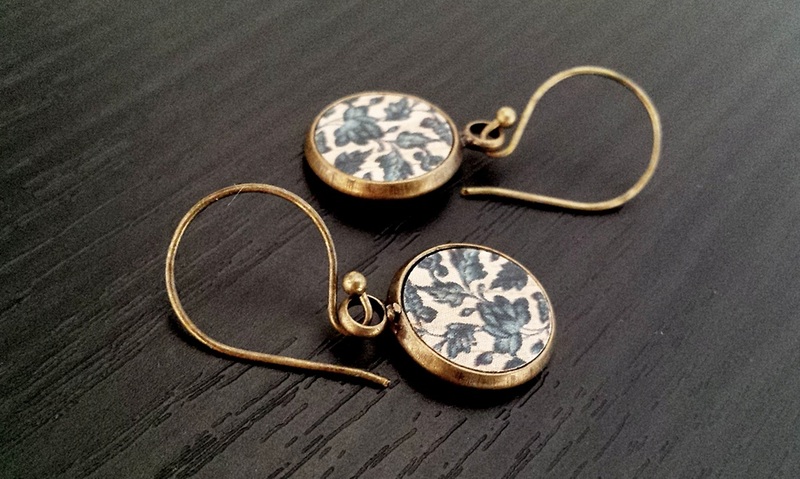 Available in Antiqued Brass or Silver, Be sure to add your correct choice to the cart. 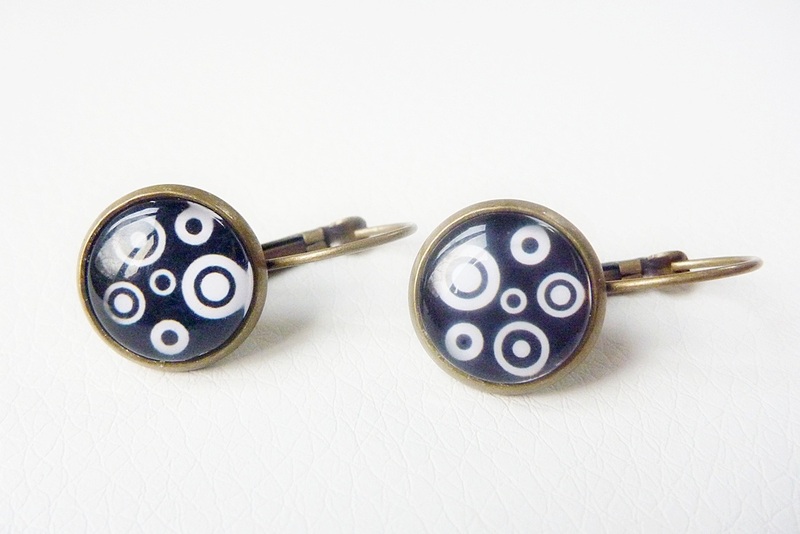 Also available as studs on request. 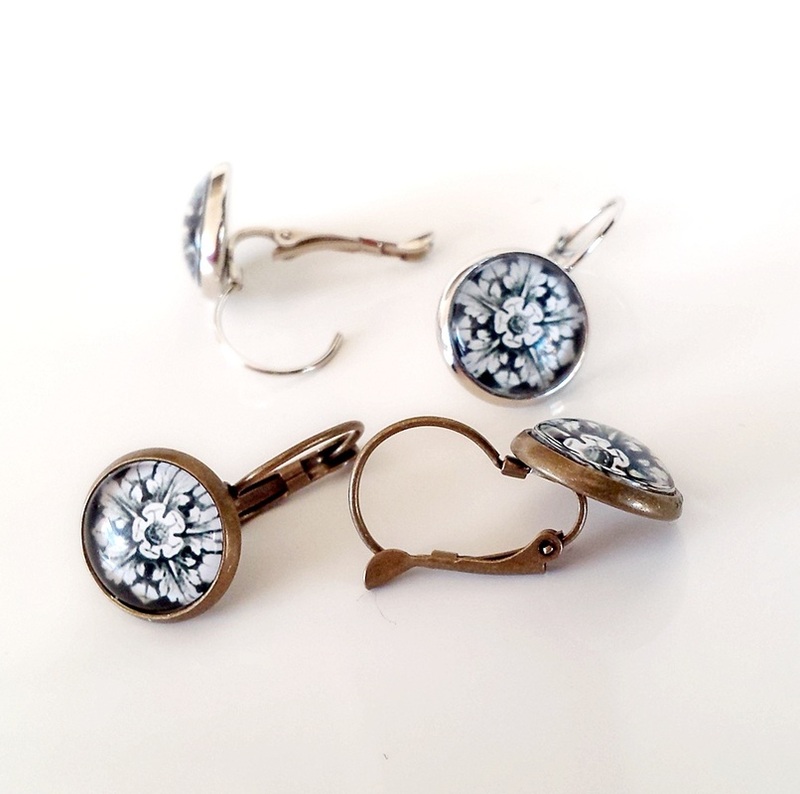 The hinged back on the French wires make them nice and secure worn in pierced ears. 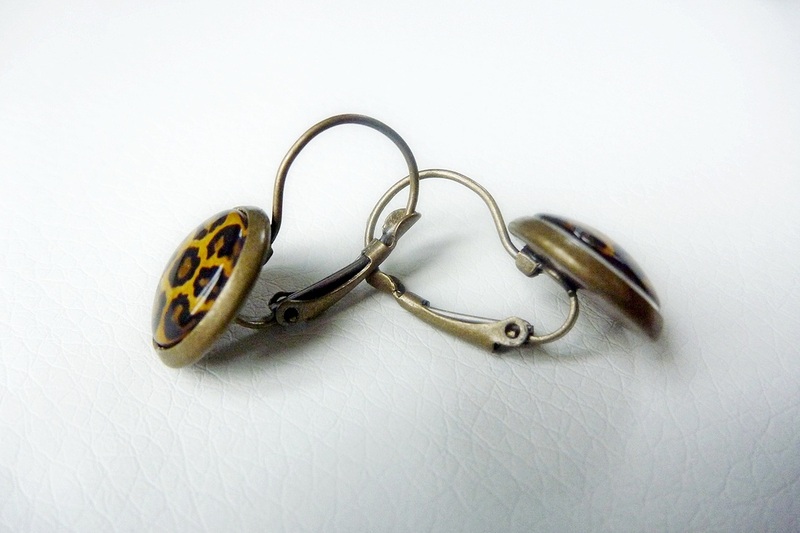 The total drop from the top of the ear wire is about 2.5cm. 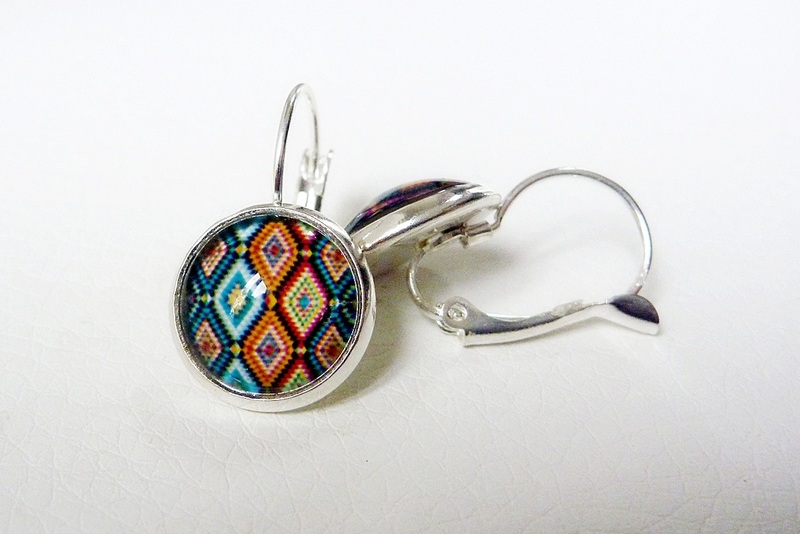 Several items can be sent together at no extra cost. 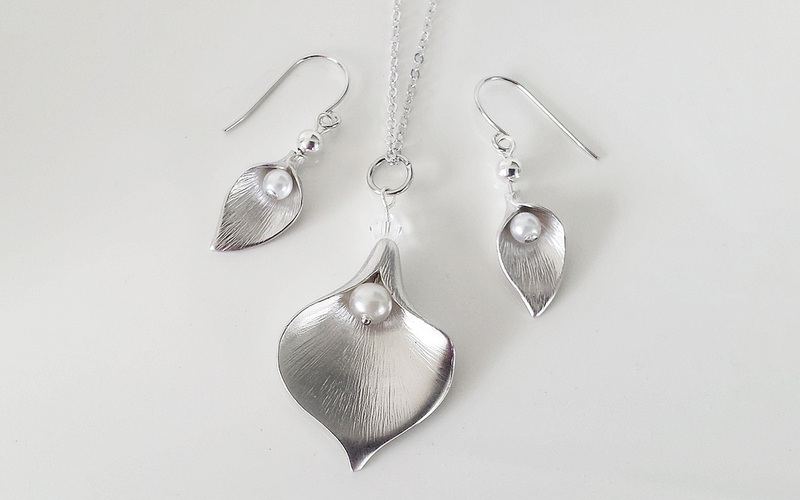 Also available in a Silver setting, Leave instruction of your choice at checkout or contact me. Otherwise I will send the brass version. 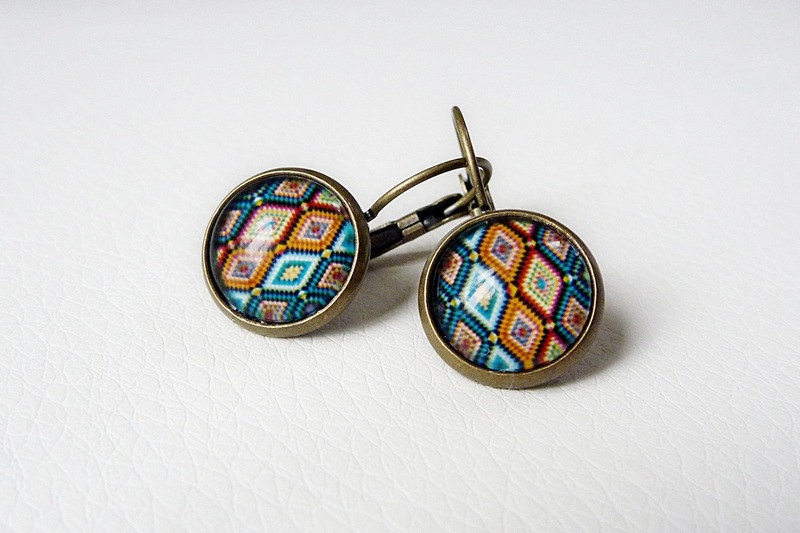 Also available as studs. 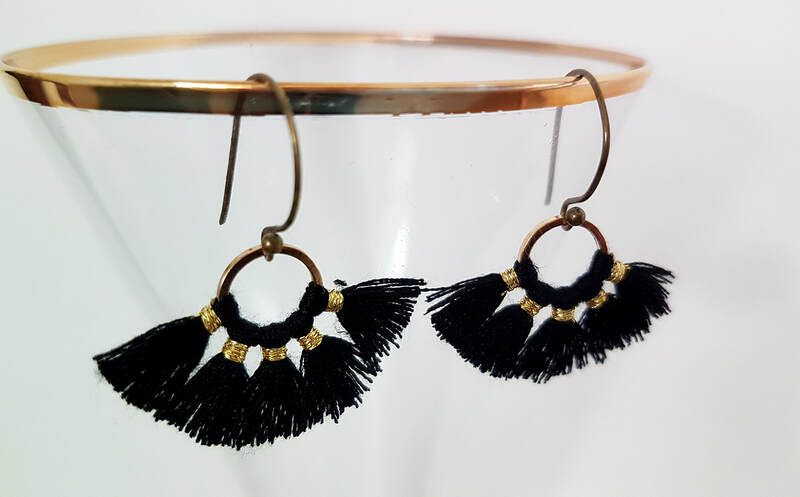 I can make several sets if needed to be sent together, just contact me. No extra cost for combined shipping. 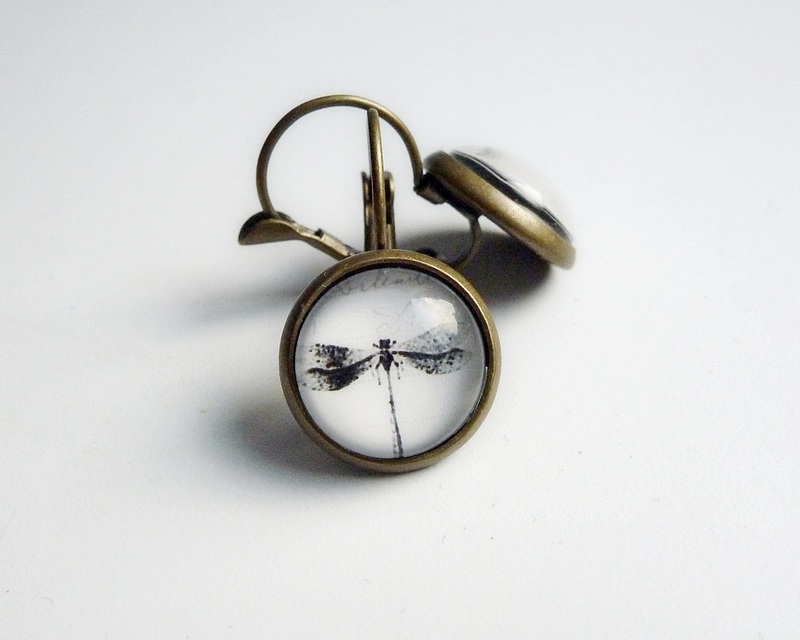 Available in Antiqued Brass or Silver, Leave instruction of your choice at checkout or contact me. Otherwise I will send the brass version. 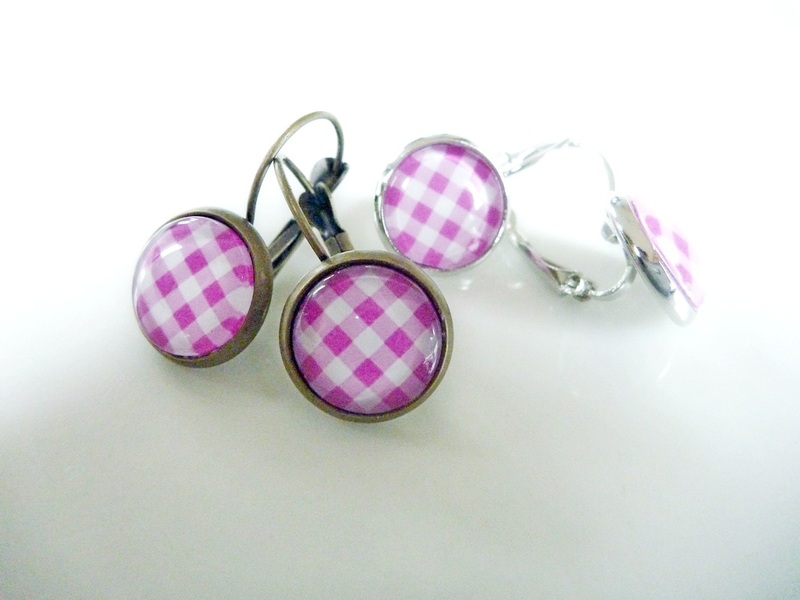 Also available as studs on request. 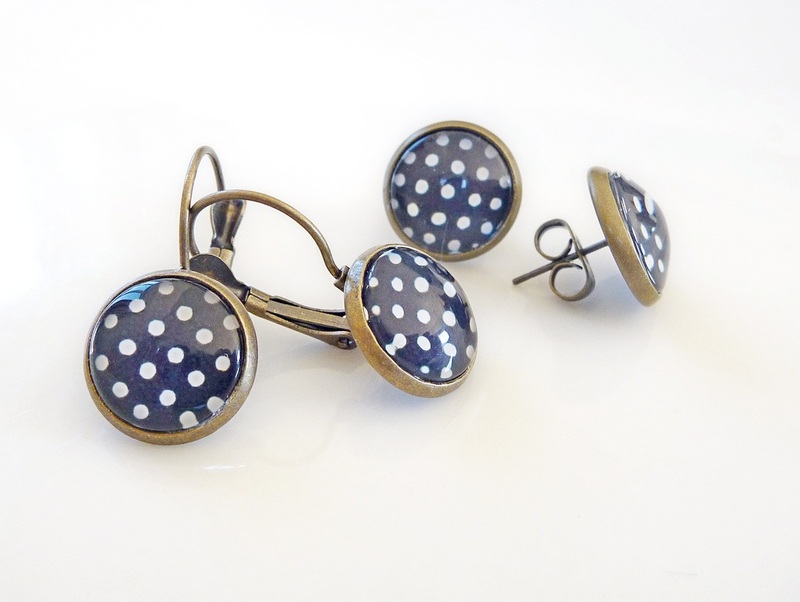 Gorgeous 14mm wide earrings with a funky black & White spotty image behind a clear glass domes. 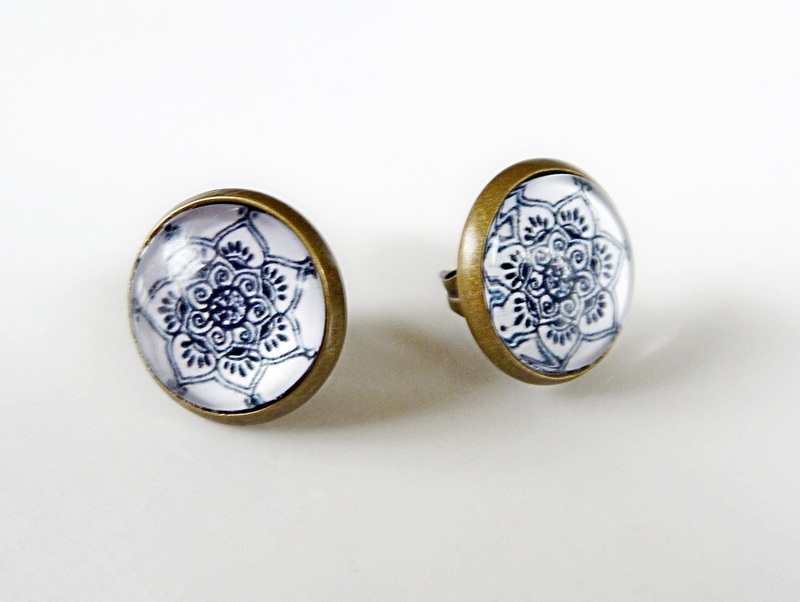 Lead & Nickel free Antiqued Brass or Silver Settings. 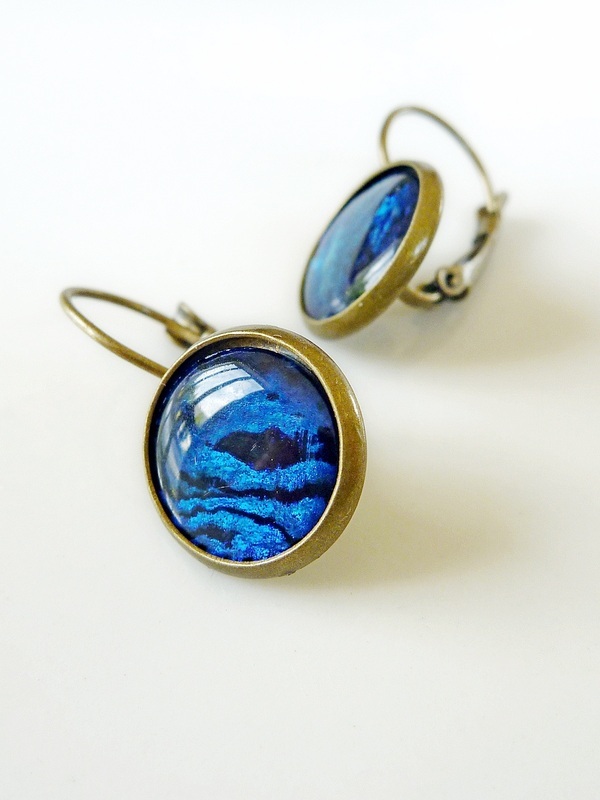 Lovely 14mm wide earrings with a stunning NZ Paua pieces shaped, recessed and protected behind clear slightly domed resin. The total drop from the top is approx 2.5cm. 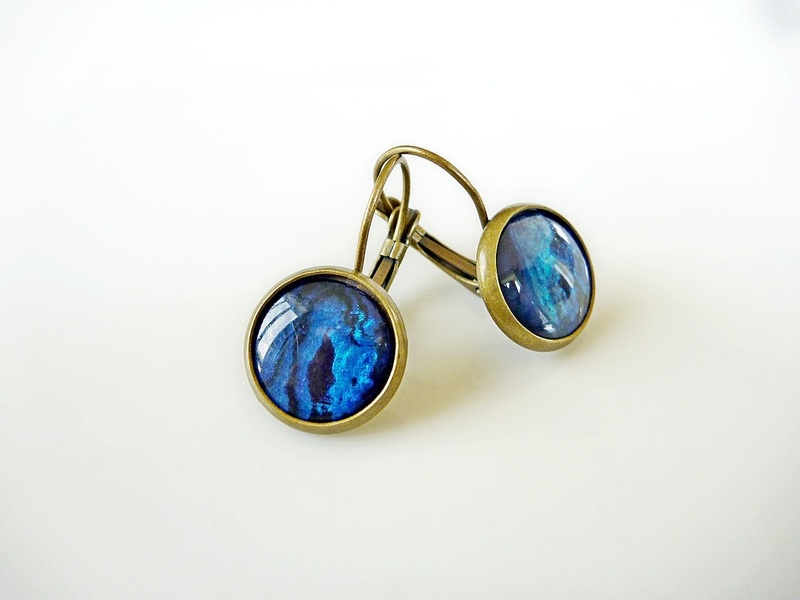 Due to the natural element of the Paua, each piece will vary slightly. 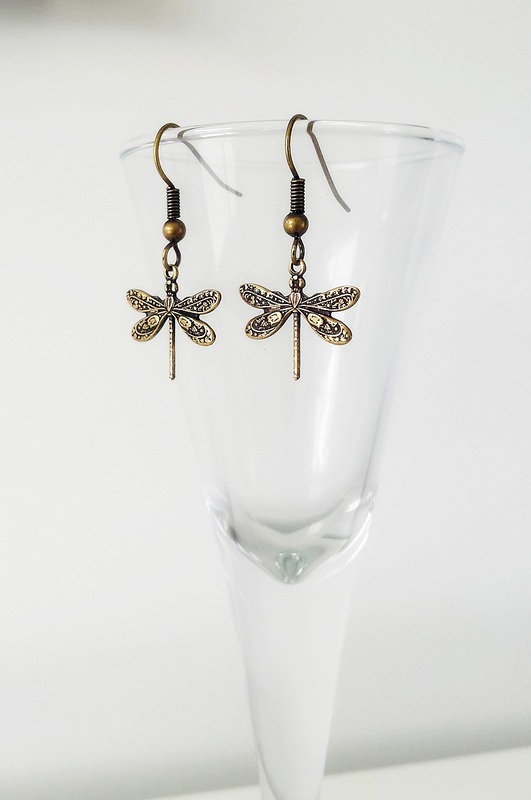 Available in Antiqued Brass or Silver, Leave instruction of your choice at checkout or contact me. Otherwise I will send the brass version. 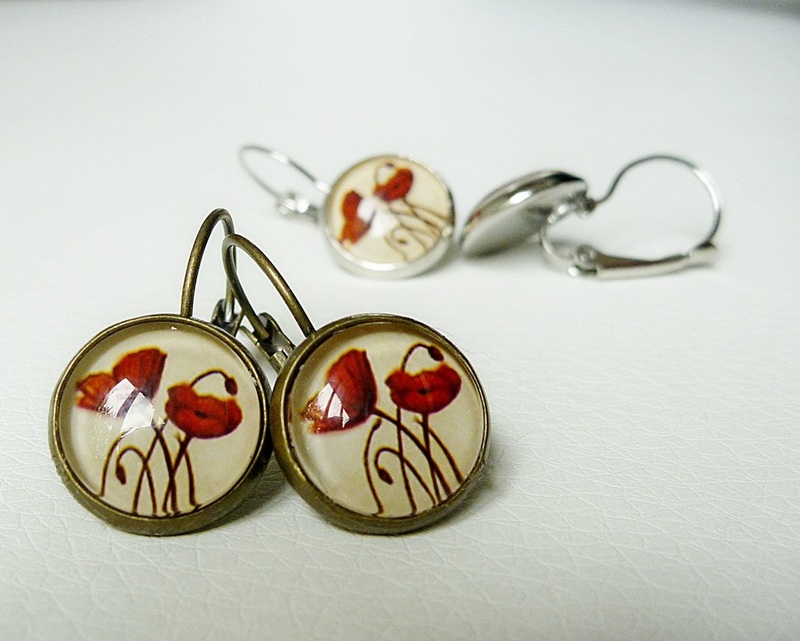 I can make several sets if needed to be sent together, just contact me. 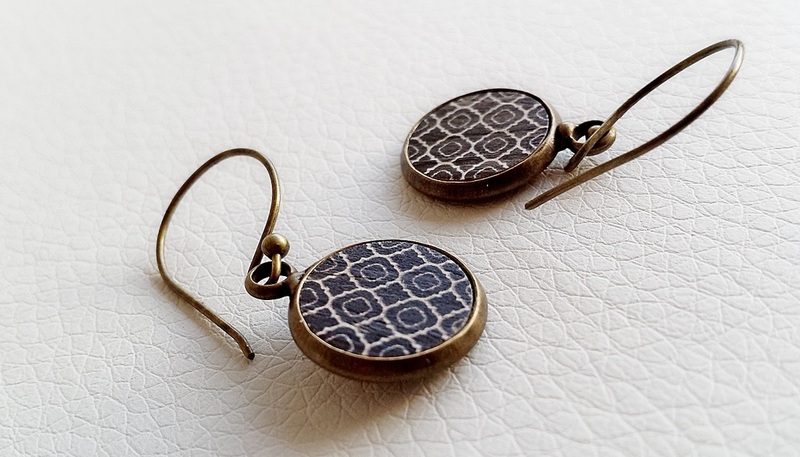 Available in Antiqued Brass or Silver, Be sure to choose your preference. 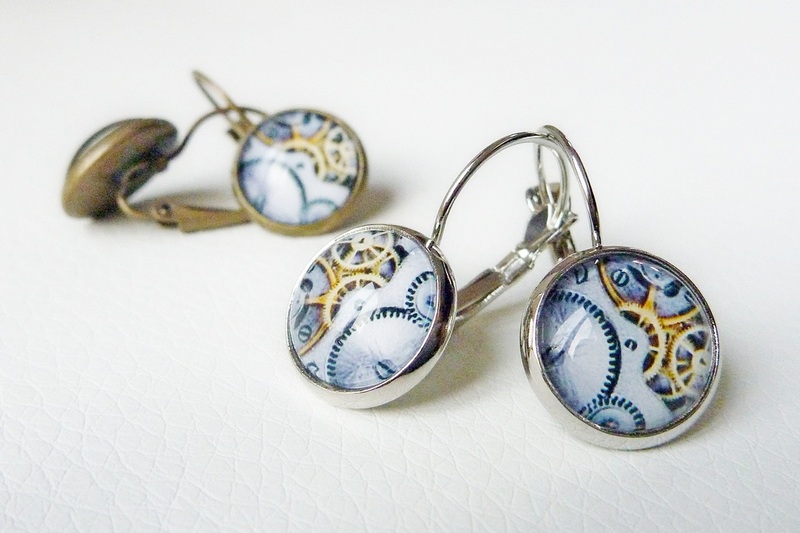 Cute 14mm wide earrings with a lovely treble clef print behind a clear glass dome. Lead & Nickel free. 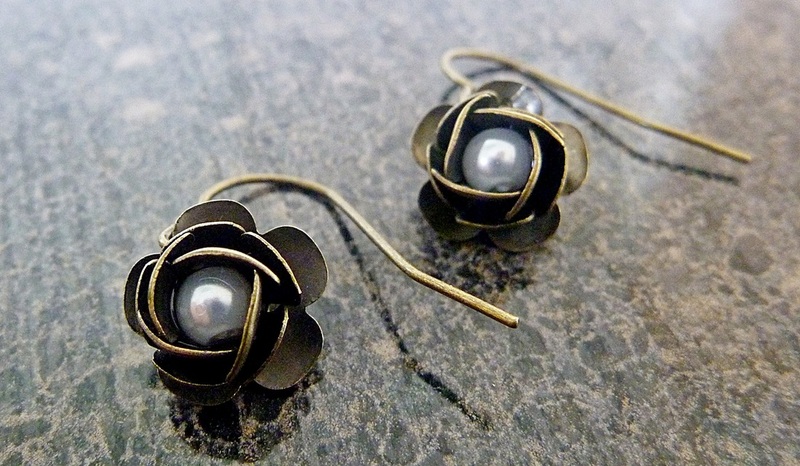 Available in Antiqued Brass or Silver, Be sure to choose your preference. 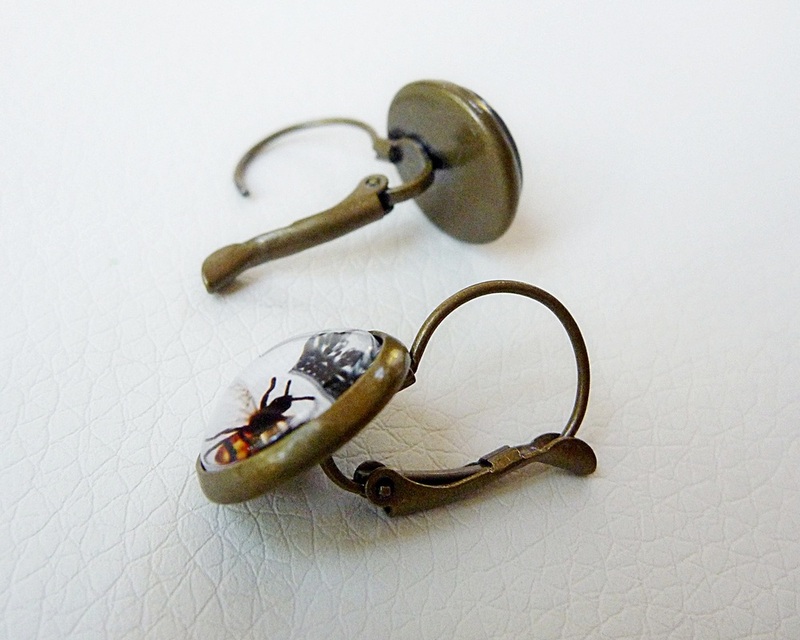 The hinged back on the French wires make them nice and secure worn in pierced ears.